It is all about focus! March 15, 2014 6:49 pm / 1 Comment on It is all about focus! “Hallelujah! All I have is Christ. Hallelujah! Jesus is my life.” God grants peace and comfort in so many ways. Not the least of which is through songs sung during morning worship time at church. No matter what is going on in everyday life and the human emotions that threaten to discourage and defeat us, God always seems to provide the wisdom and encouragement we need. 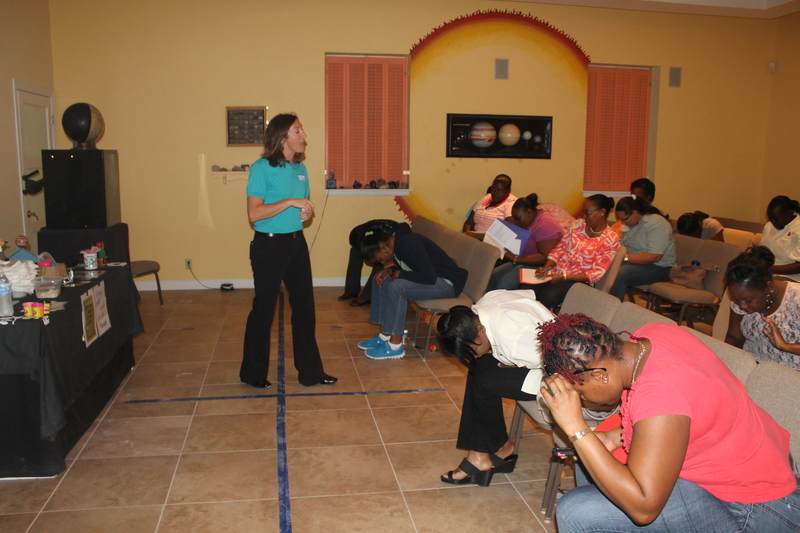 We praise God for Kingdom Life Church. The strong expository preaching, the faithfulness to scripture, the focus on God, and the loving way KL members interact with us and with one another not only edifies and encourages us but also challenges us to keep our focus where it belongs: on Christ! We came from strong Christ-centered churches in Minnesota and Wisconsin and are so grateful that God directed us to yet another church that is not only similar but also does what a church is supposed to do: faithfully teach God’s Word, edify, encourage, admonish, etc. Many of you have sent us words of encouragement and assurances of prayer in response to our last brief blog and prayer request email. Thank you from the bottom of our hearts! God has answered, and although it may not be exactly how we would like to have had the prayers answered, we are content. Because we KNOW that God is sovereign and in control of all things and is a God of love who does everything for His glory and our good, we are resting in His answer as being the perfect answer. We have adjusted our perspective of things to match His perfect perspective. 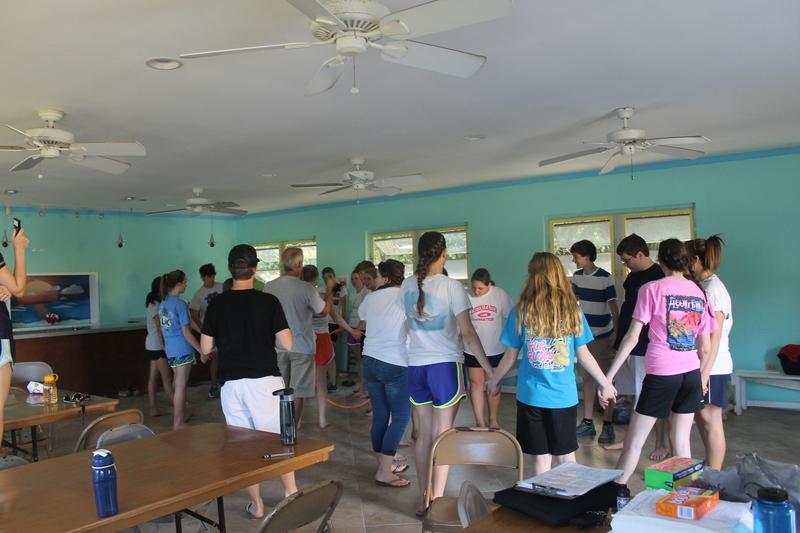 Our focus remains on Christ, and as that focus on Christ is manifested in our service to the Bahamian people and those who come to serve the Bahamian people, please pray that God continues to give us strength, courage and a focus that is on Him and Him alone. Please forgive us for not updating this blog for almost 2 months. We have been told we have done a great job at keeping everyone updated this last year and that we should not feel guilty for not writing more often. We appreciate the assurance. Our absence from updating our blog is not intentional but a mere necessity right now in light of how busy we have been. Logan just finished up his 3rd term with Liberty University online (he is a dual enrollment student working on course work through Liberty University Online). He completed courses in biology, psychology, speech communications, and US History, and philosophy. 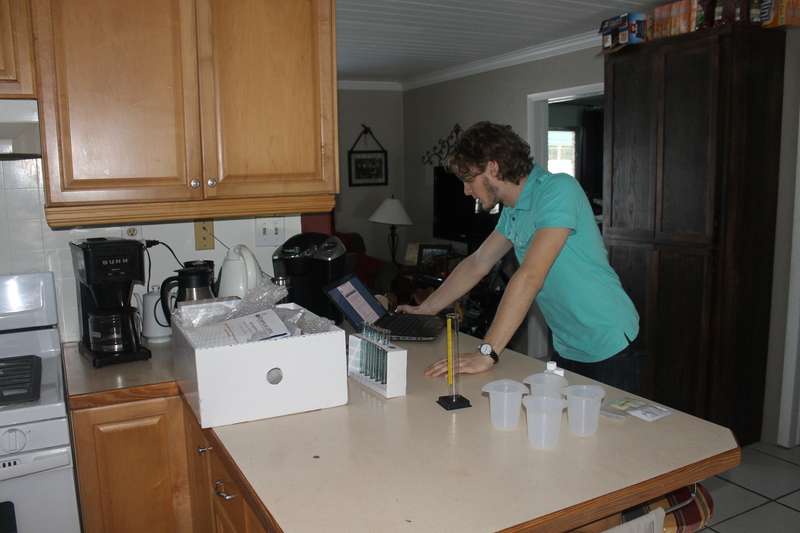 He is currently working on Biology lab and will be starting a macroeconomics and a statistics course this next week. He continues to help at the Centre 3 days a week. Time is going by so quickly, and it is hard to believe he will be leaving us soon. We are working through issues right now, but it looks like our decision to move out of the country is going to negatively impact college tuition for him. He will be attending the University of Minnesota as an out of state resident. Please pray they look favorably on his situation. Growing in wisdom but mostly in stature…Zachary is now 6’2 1/2 and does not appear to be done growing. He is so unlike his 3 older brothers in stature and stands a head taller than all of us. He remains our gentle giant with a heart that is so sensitive and kind to the needs of others. He is trying to stay caught up with his school work and seems to be enjoying his courses this year. Besides his normal courses, he is taking a Graphics Design: Photoshop class online. 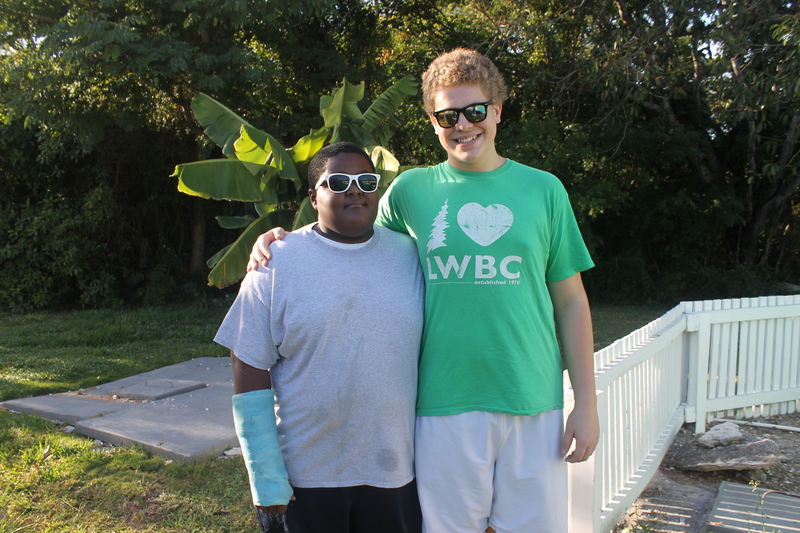 This summer he hopes to get to spend a couple of weeks with his best friend Granton Ledgister at his house in Tennessee. We hope we will be able to let him do this. Please pray for the funds for this trip and for Zachary that he will be able to remain focused on his school work despite my inability to be with him all the time. Tim continues to work very hard trying to juggle the duties that come with being Camp director. A lot of what he does here at camp is not seen, and because of that, it may seem he is not doing much. Let us assure you, the man is overwhelmingly busy. 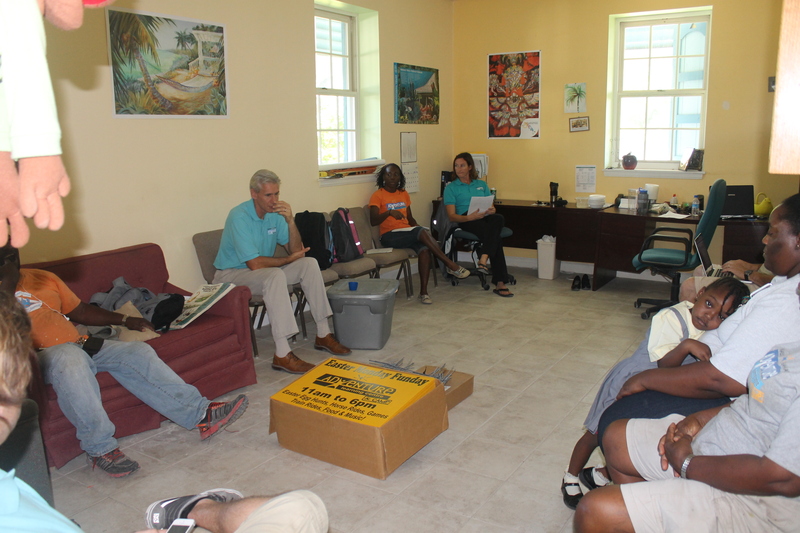 Besides countless hours answering emails/phone calls and trying to work through logistics with future guests and mission teams, he is busy making contact with Bahamian pastors and youth pastors, building relationships with past Joy Bible Camp campers (he is trying to lay the ground work for developing a camp ministry for Bahamian children), assisting with budget and operational issues at the ALC, and maintaining the facility and grounds here at the camp. 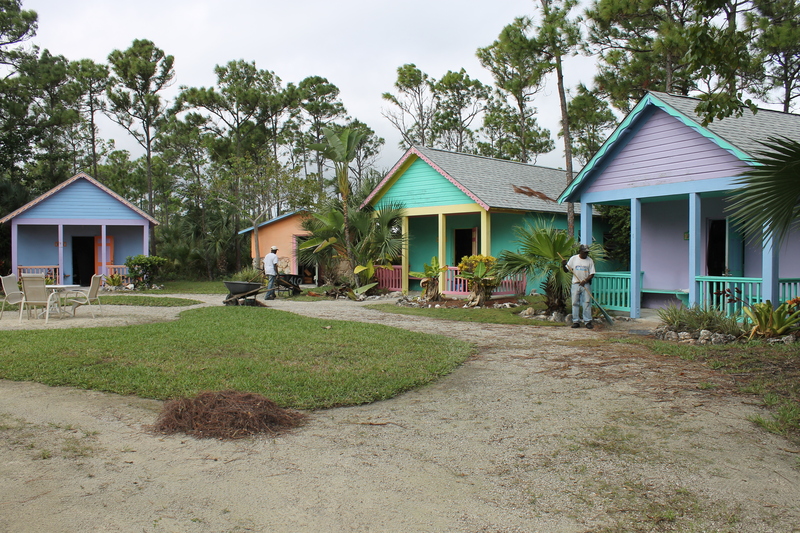 He is also very busy doing maintenance and grounds improvements here at Camp. 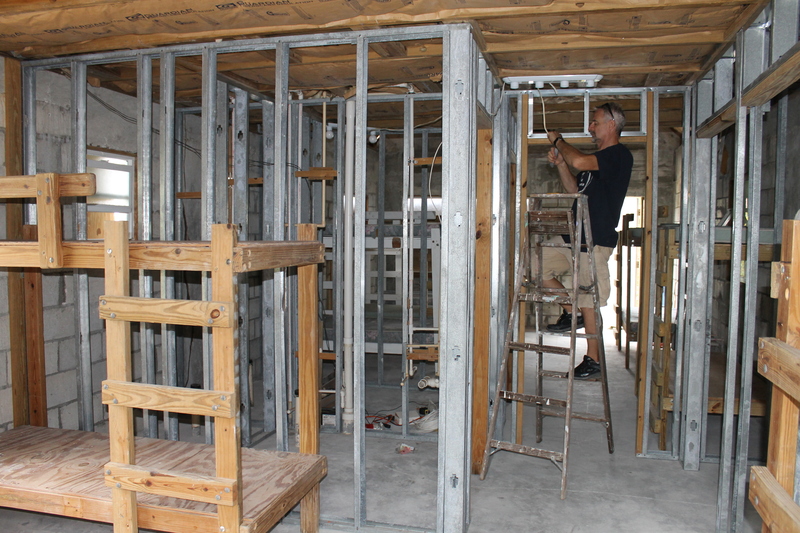 There are big construction and improvement items in the works for this year (we will update you on this in the near future), and there is not a day that goes by that someone does not come to him with something that needs repaired or fixed. With our maintenance guy overworked as it is, a lot of maintenance issues fall into Tim’s lap. 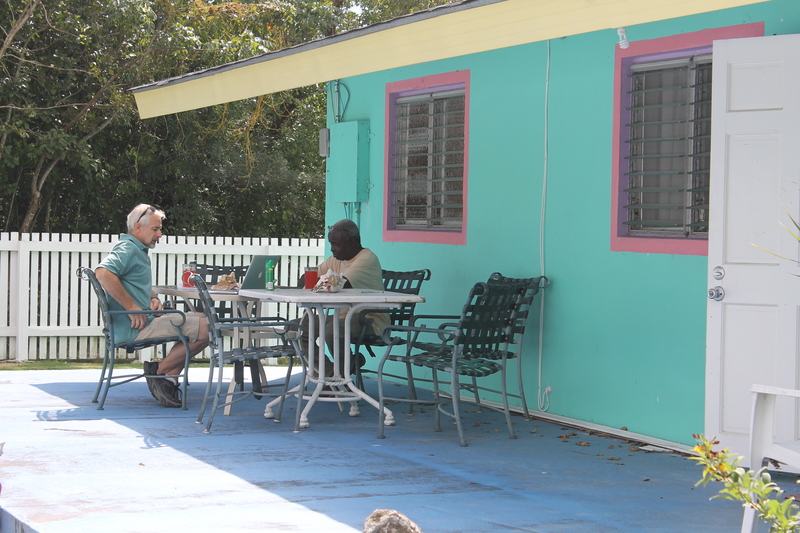 Please pray for Tim’s ability to focus on priorities, his ability to find time to rest, and for wisdom in his dealings with those we minister to (both Bahamian and foreign). 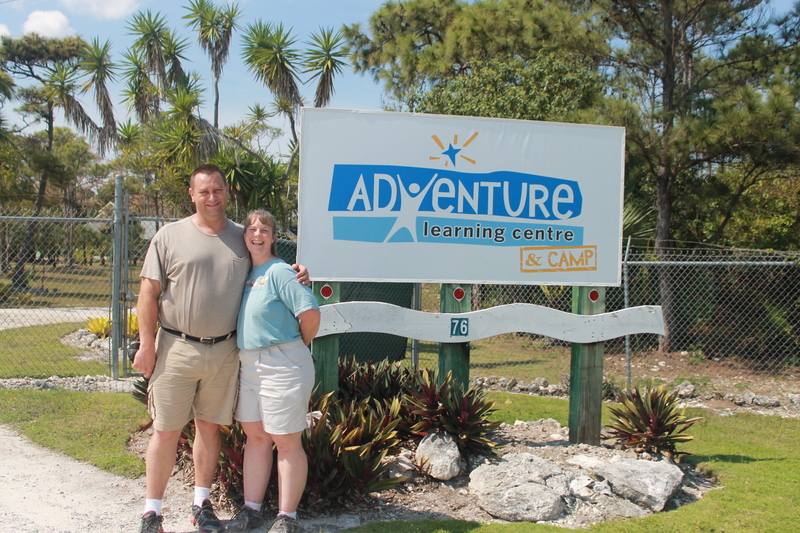 We welcome to the ALC staff family, Bob and Judi Balson from Wisconsin. 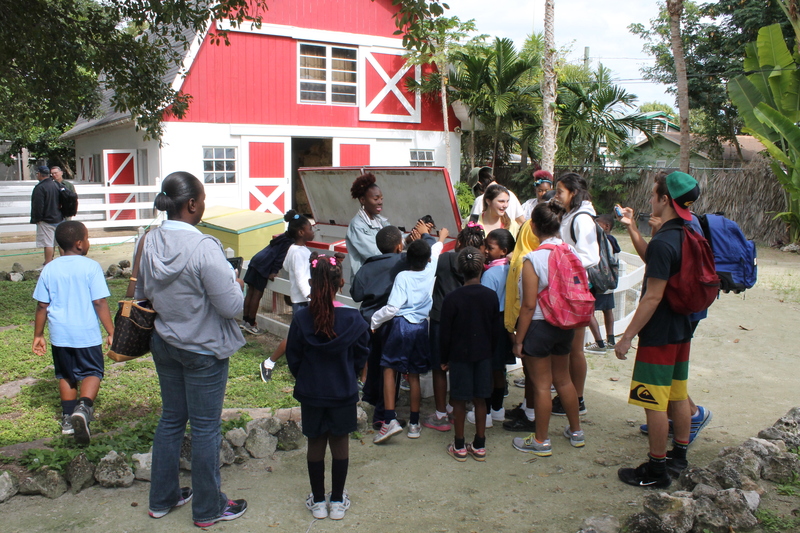 They have been coming to the Bahamas on short term mission team trips for many years, and last year they answered God’s call to come and work full time serving in the Bahamas. We are so excited to have them here. 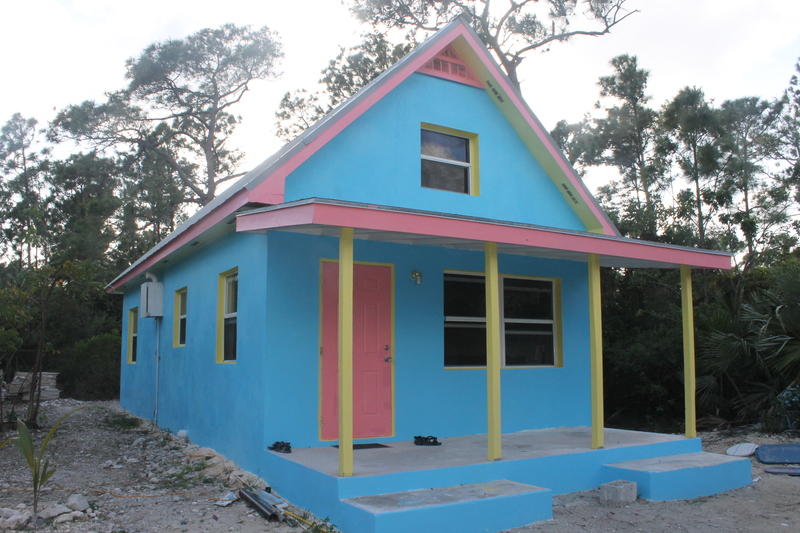 They will be working with us to serve the groups that come to serve here in the Bahamas by helping with cooking, housekeeping, maintenance, and other various duties here at camp. They will also be helping at All Saints Camp on occasion. They have jumped right in and have been doing a lot to help the ministry here. They are doing such a wonderful job at taking initiative and getting things done. Truly they are a god-send! 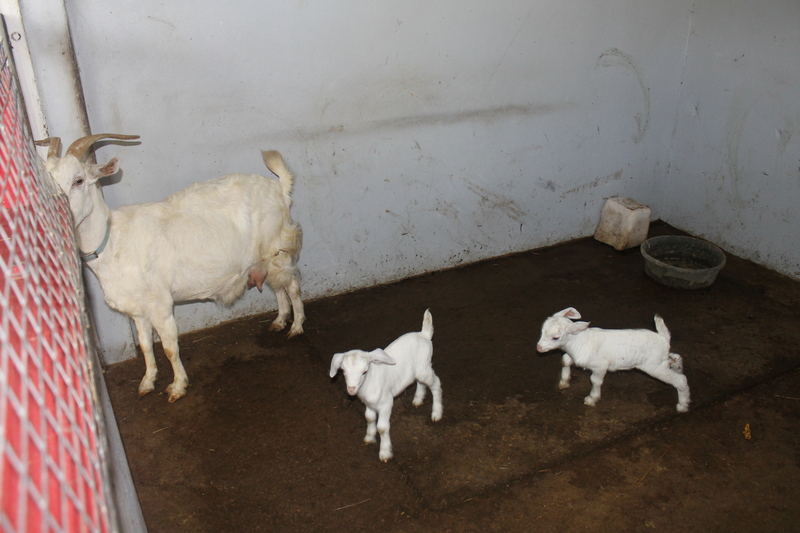 As you will be able to tell by the pictures below, we have served a lot of people the first 2 months of 2014. Today we have a large group of leaders from Zion Baptist Church here for a leadership training conference. Next Friday, we will begin hosting a Canadian pastor and his wife at Camp as they are here on a fact finding trip to see if they will bring a mission team here in the future. Also, next Friday we will welcome a group of middle school children from Calvary Chapel Ft. Lauderdale here for a 5 day mission trip. 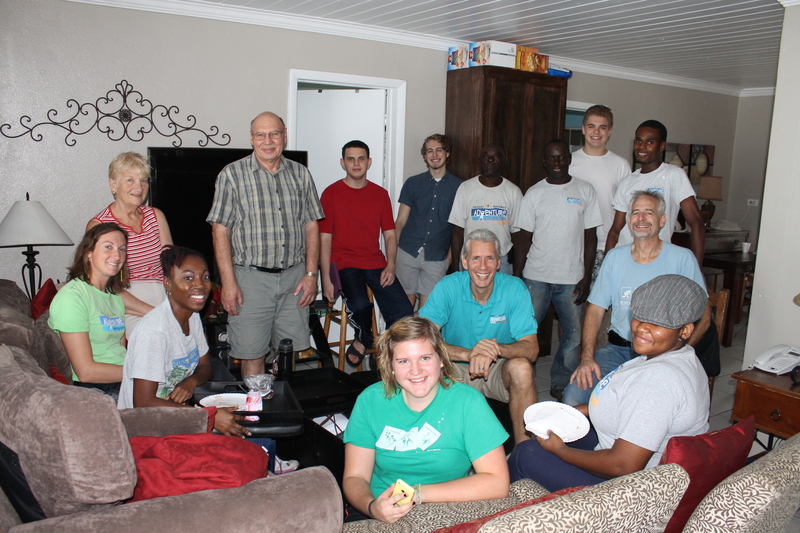 While, the Calvary Chapel young people are here, we will welcome a group of 13 adults from Peace Church in North Carolina. This adult group has been coming here for years and are such a blessing to this ministry. Please pray for us as we juggle the overlapping schedules of these groups. 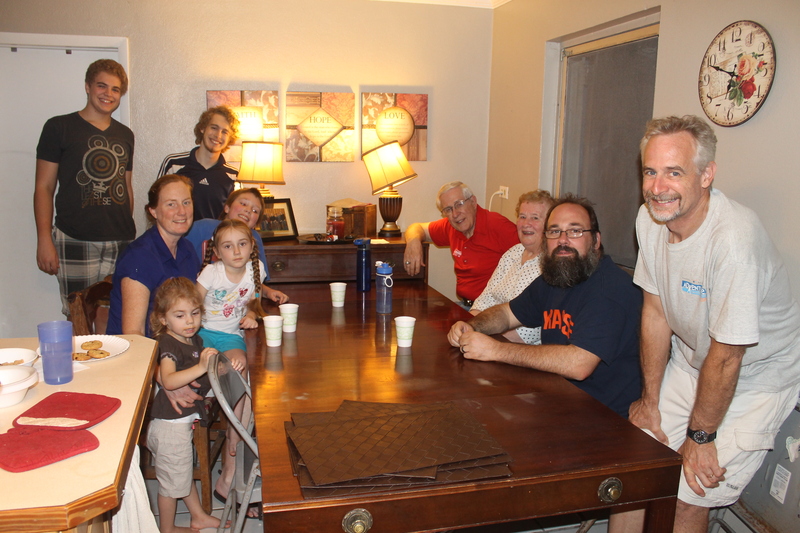 Living in community has its benefits…fellowship and lots of it. 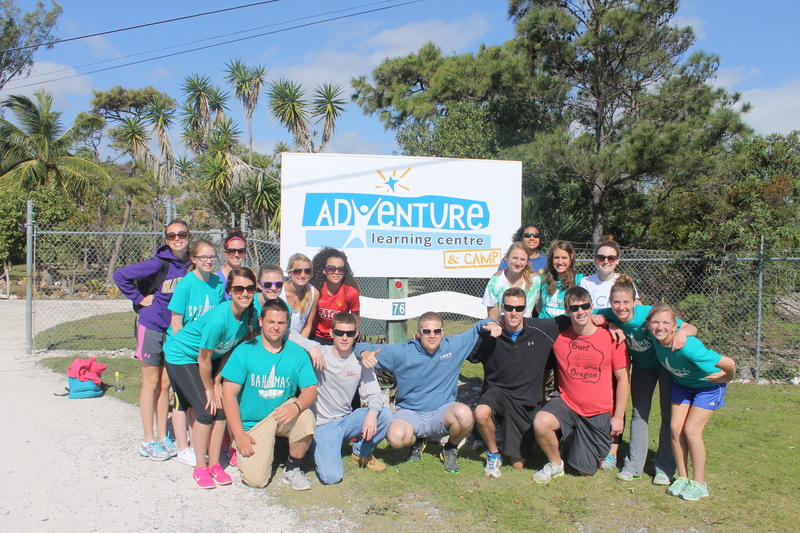 This particular day, the Centre facilitators helped us out with preparing camp by helping deep clean cabins. The grounds keepers (Nape and Celavie) busily prepared the grounds. 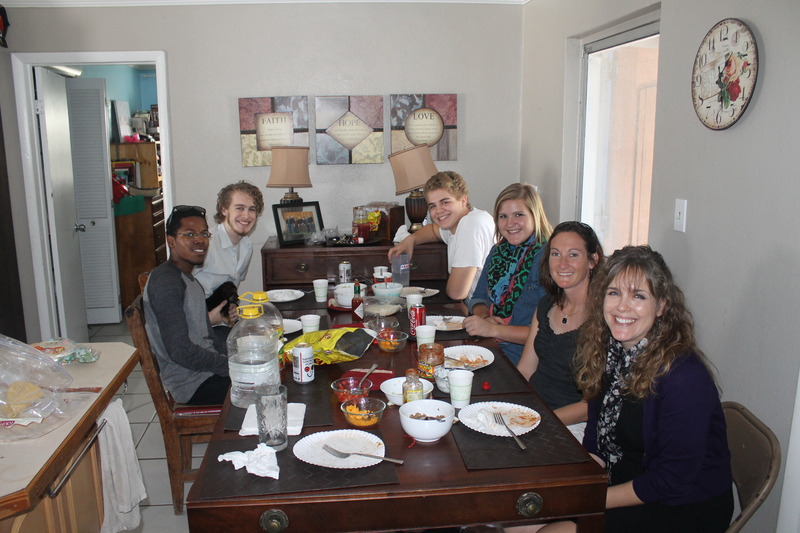 We had lunch together at our house. Logan making screens for the girl staff cottage. January was a busy time for us as we continued work on getting the girl staff cottage finished (there are still issues being worked out). 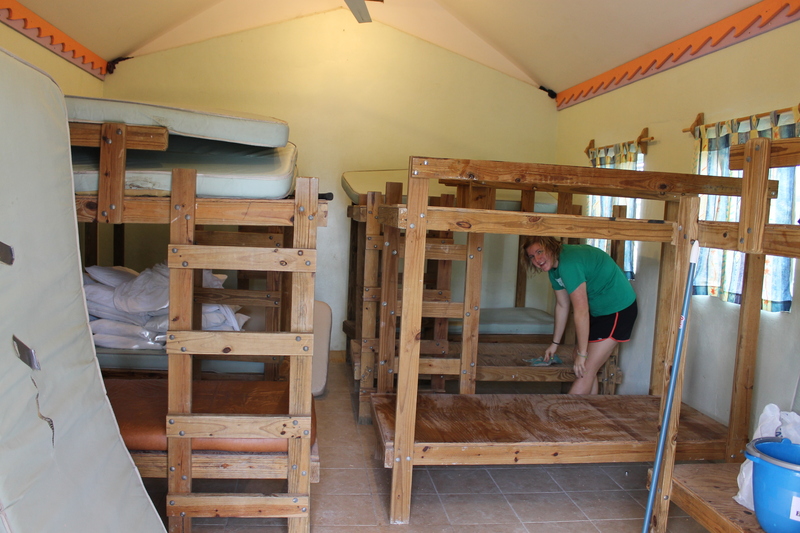 A huge challenge as we anticipated serving Calvary Chapel’s 8th grade class was finding enough beds for them all. The camp was designed to comfortably sleep 70+. 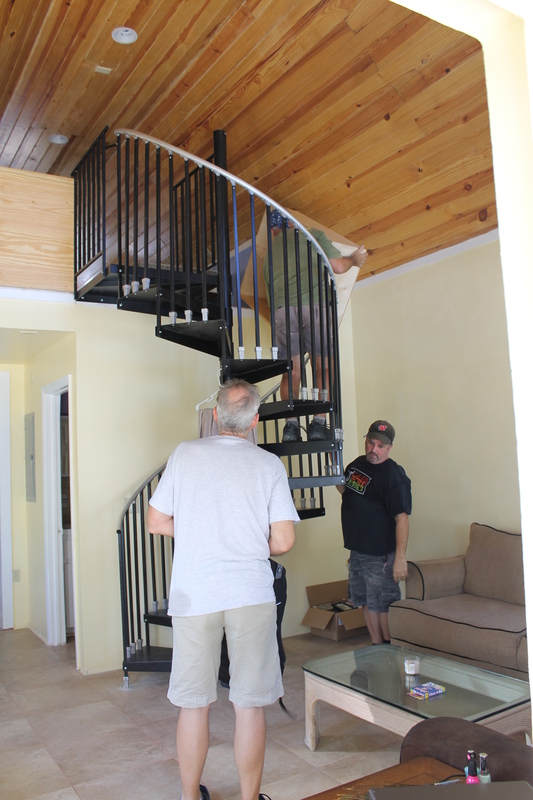 We transformed an unfinished cottage into a sleeping space for 18 and reconfigured all the bunks in the cabins to accommodate 16 people instead of 14. This took a lot of work from a lot of people, but we are glad to say it all worked out. 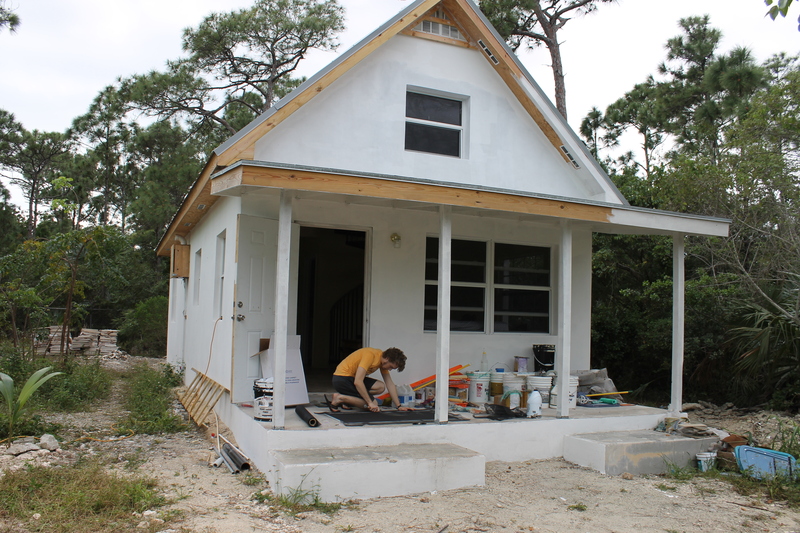 Please pray as we make plans to finish this cottage this year and as we hope to work on possibly building another cabin. 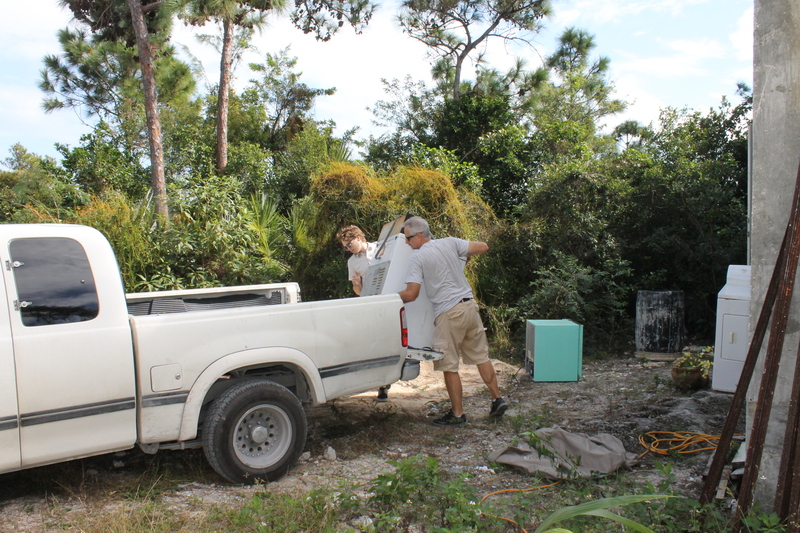 Getting ready for Calvary Chapel also meant cleaning out areas that were used for storage. 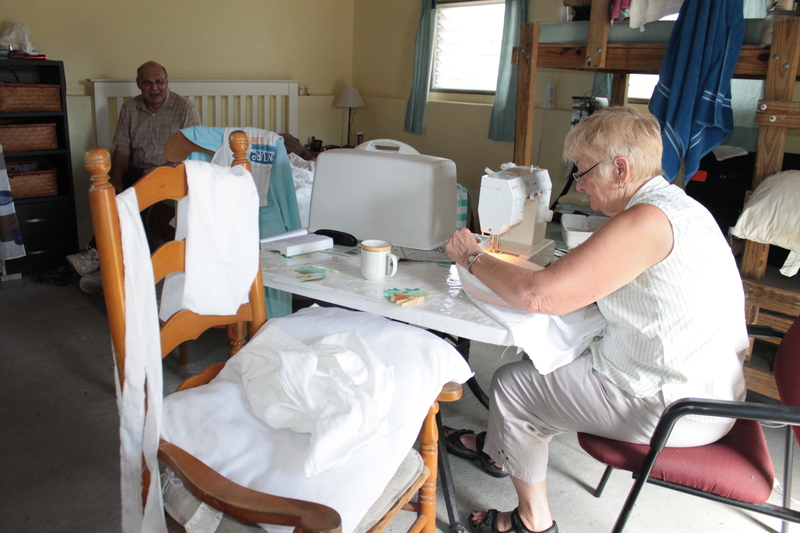 Faye worked on making pillow covers for all our pillows so we have clean, sanitary bedding for our guests. Tom Schafer and Tim Ryan built bookcases for the girl staff cottage to act as storage and privacy barriers. 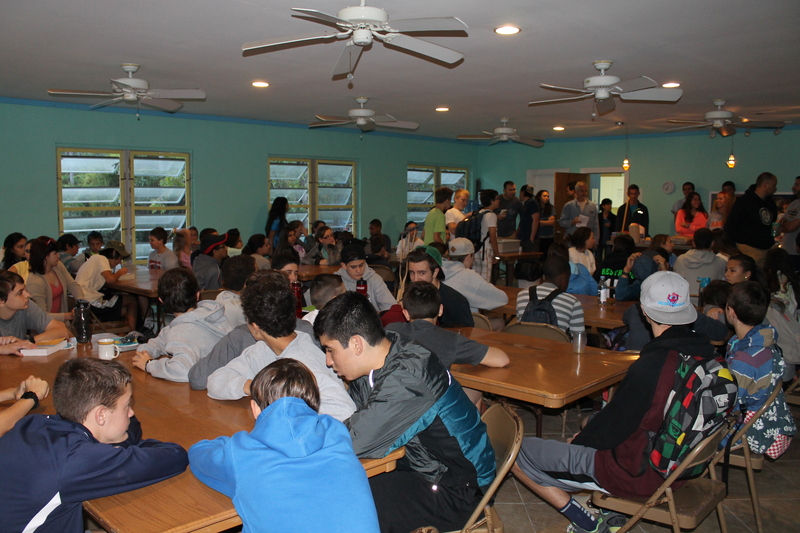 On January 16th, we welcomed our first HUGE group to camp. 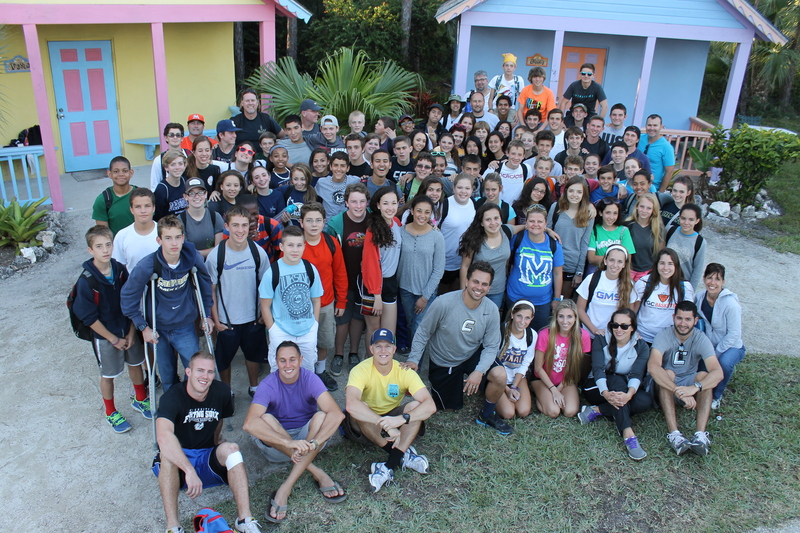 Calvary Chapel Academy 8th Grade I arrived for their 5 day mission trip. We all learned a lot during this week. 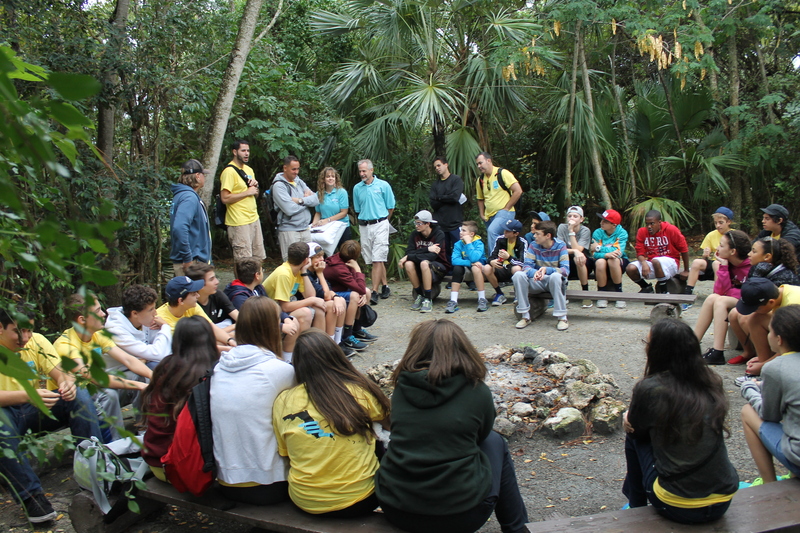 Sleeping arrangements weren’t the only challenge we faced by having this huge group. Our dining hall is not designed for a group of 100 people. Meal time was a challenge. 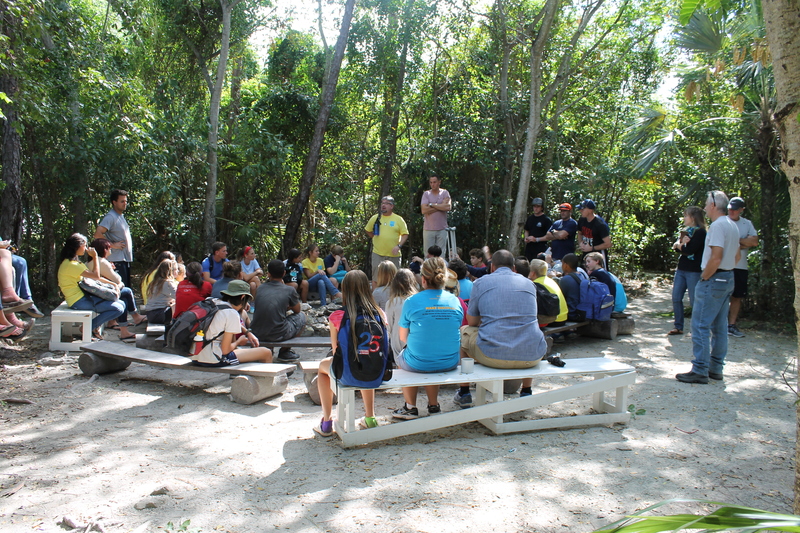 Please pray as we work on plans to increase our cooking and dining capacity at camp. 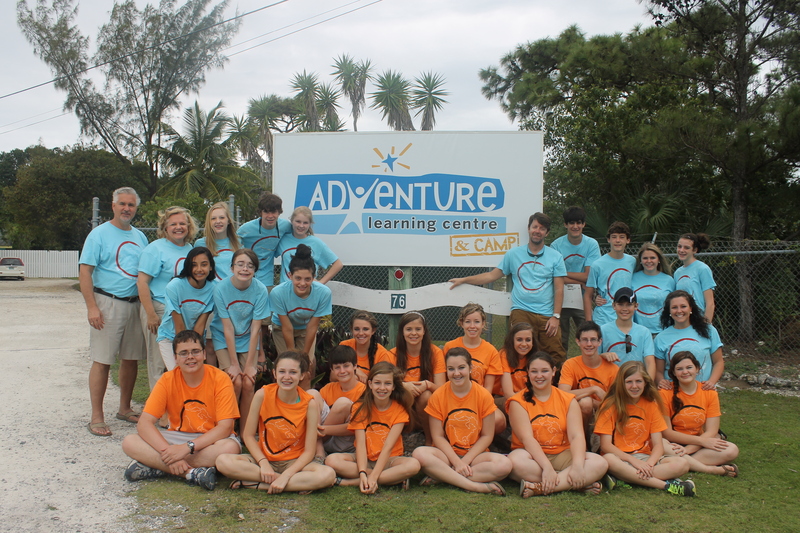 The CCA 8th Grade I team did outreach work at schools, served at All Saints Camp, evangelized downtown and worked at the ALCentre during the school programs. 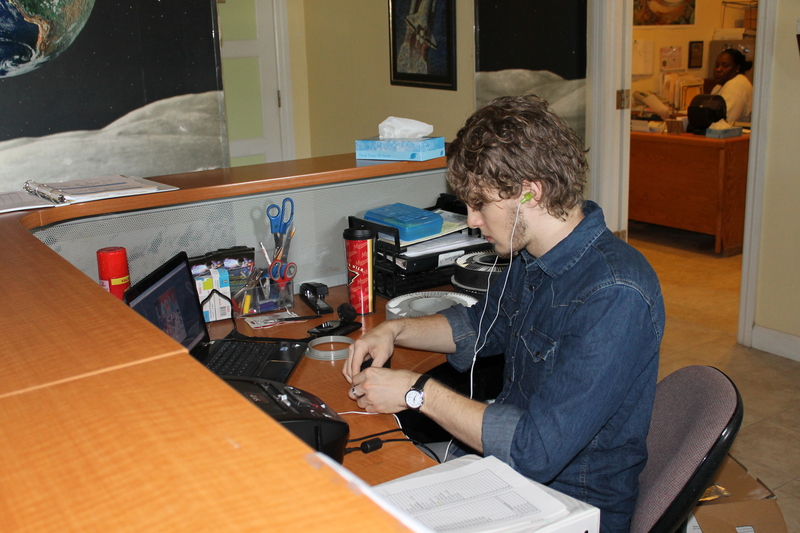 One project Logan is working on during his time at the Centre is scanning slides for the Planetarium show. In December we received an email from Denise Young telling us she would be on the island January 18th when her cruise ship was in port and that she wanted to see the ALC ministry. 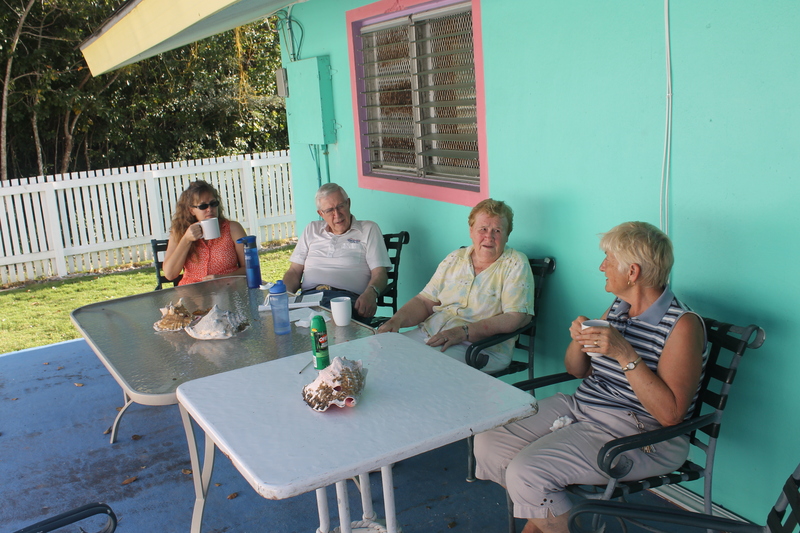 I was able to pick up her and her cousin’s wife at the port that day and show them the island and the ministry. 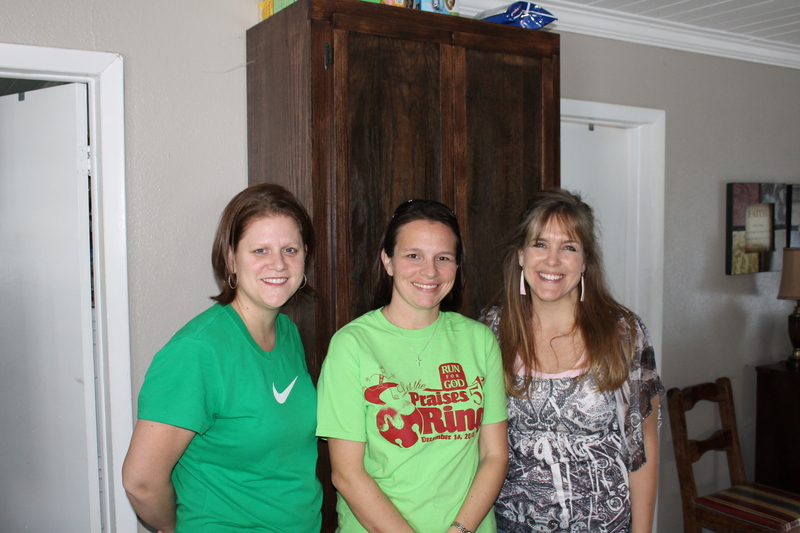 This is Denise on the left and Abby Hunt in the middle. Elton Deetjen (one of our facilitators) won a half marathon here on the island. Way to go, Elton! What does a group of 98 look like? Here is CCA 8th Grade I.
Calvary Chapel’s leaders met at our house for a planning meeting after they heard word that one of the flights for their group was cancelled. It is not easy getting flights for 50 people in a group when their flight is cancelled. 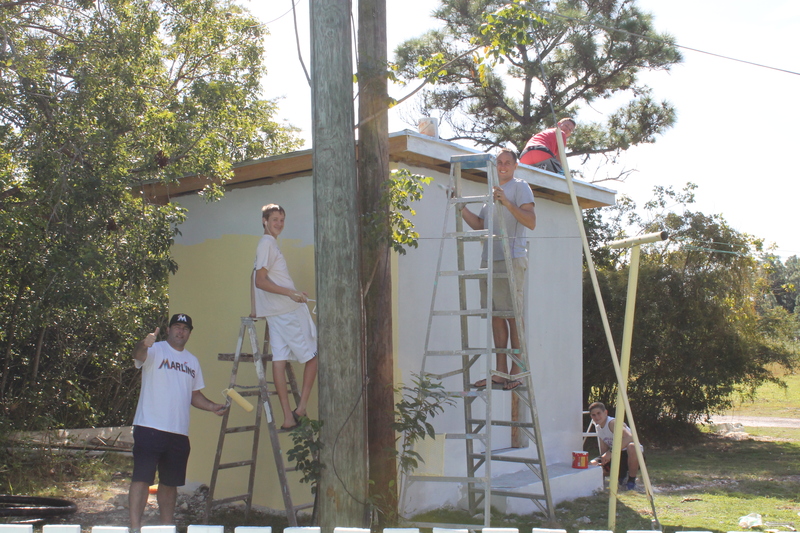 …another thing they did was paint the electric house. Logan’s computer skills keeps him in high demand. 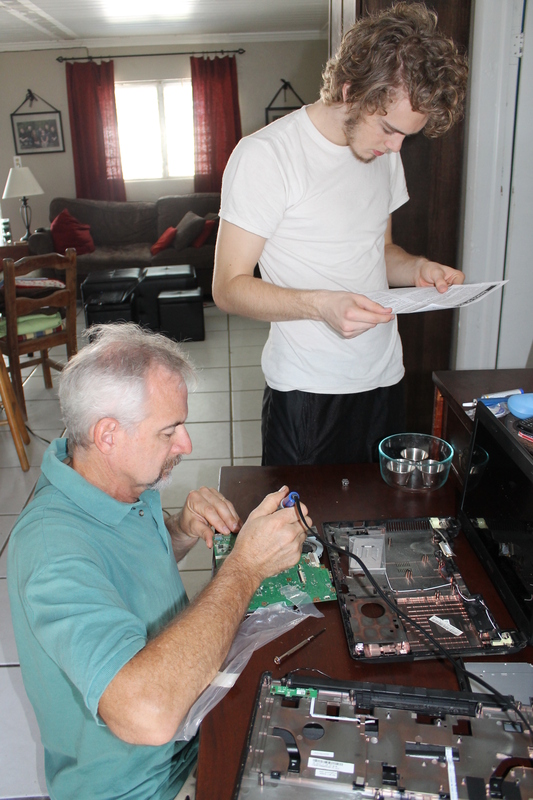 He tried (without success this time) to resurrect a friend’s computer. One perk of living in a tropical area is the fun fruit/veggie trees/plants that produce at various times throughout the year. This is a dilly (short for sapodilla). It is delicious–tastes just like brown sugar. 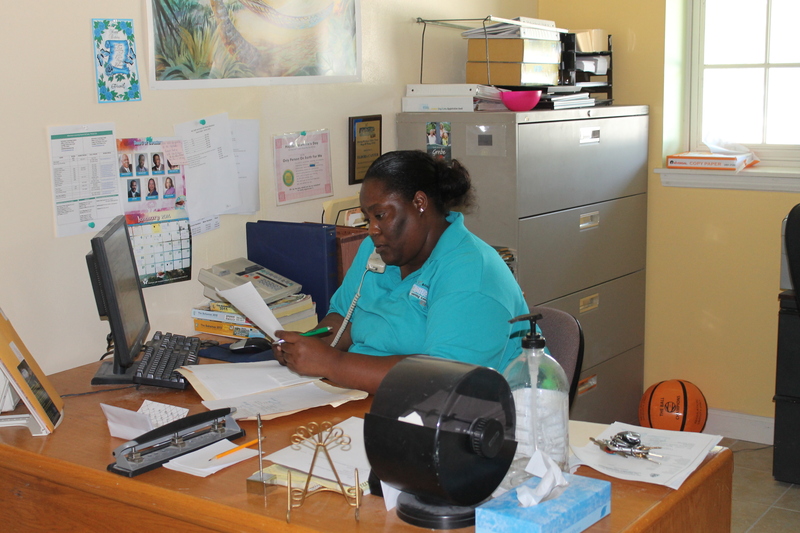 Eldora is the office manager at the Centre. We can not thank her enough for all she does. 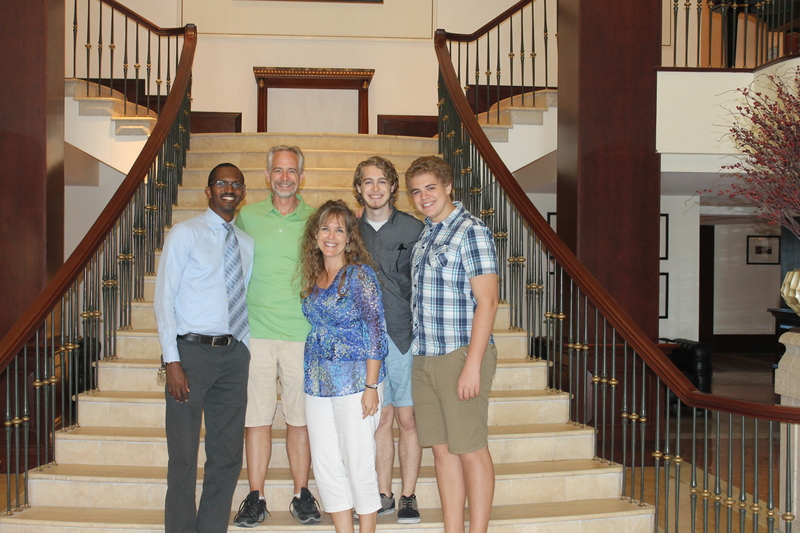 We finally were able to have our senior pastor and his family over for a meal at our house. This is Cedric, Alexine and Abby Moss. The girls had us over for a meal in their new house. 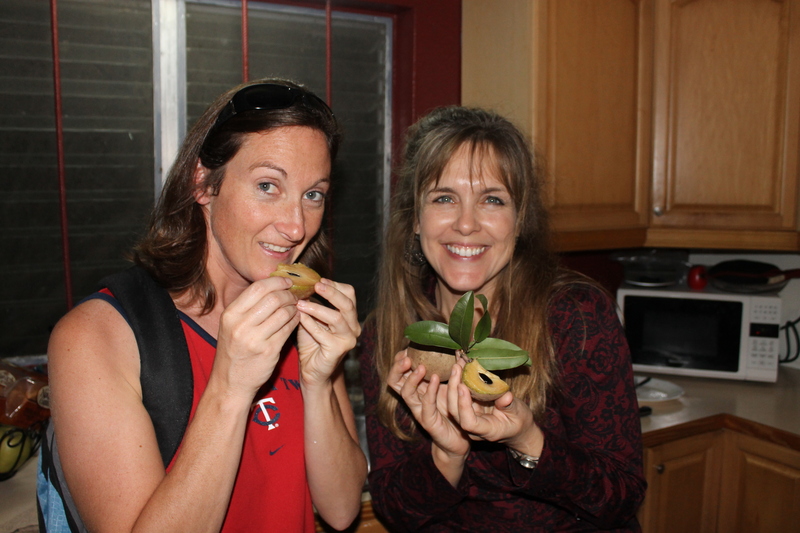 We were the first guests in their new home. Zachary and RJ (Eldora’s son) are really good friends. RJ fell and broke his arm. It is doing better now. Every weekday morning, the ALC staff gets together for a time of devotions and prayer. This is such a special time for us as a ministry family. 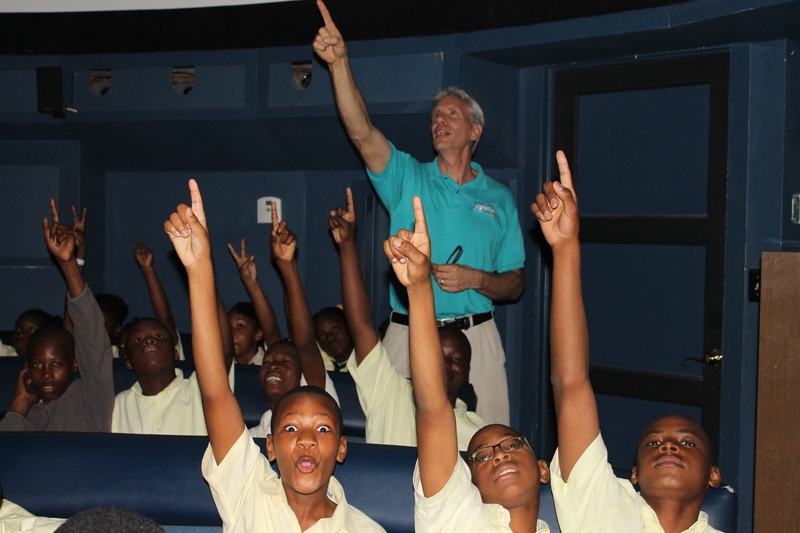 Mark’s (Director at the ALCentre) favorite job–teaching the planetarium program. 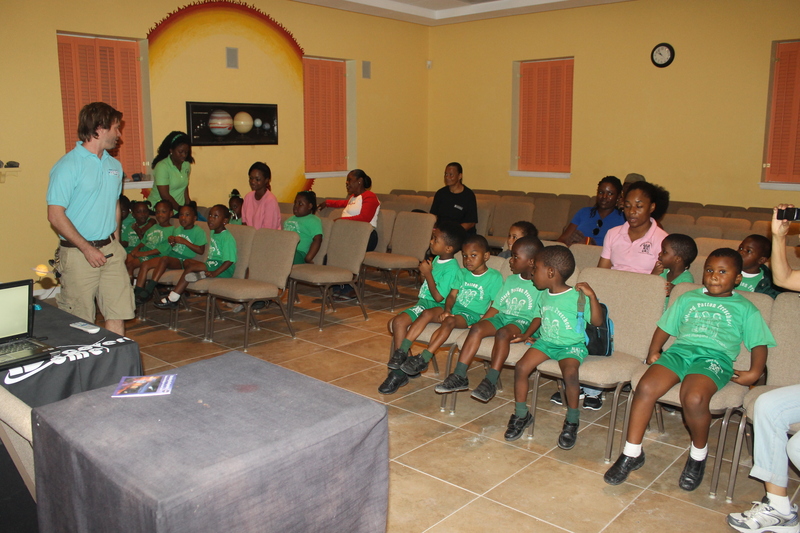 Eric (Program Director at the ALCentre) teaching the planetarium program to a group of Bahamian school children. Tim’s parents came for a visit at the end of January. We were so glad to have them. This was their first visit since we arrived a year ago. 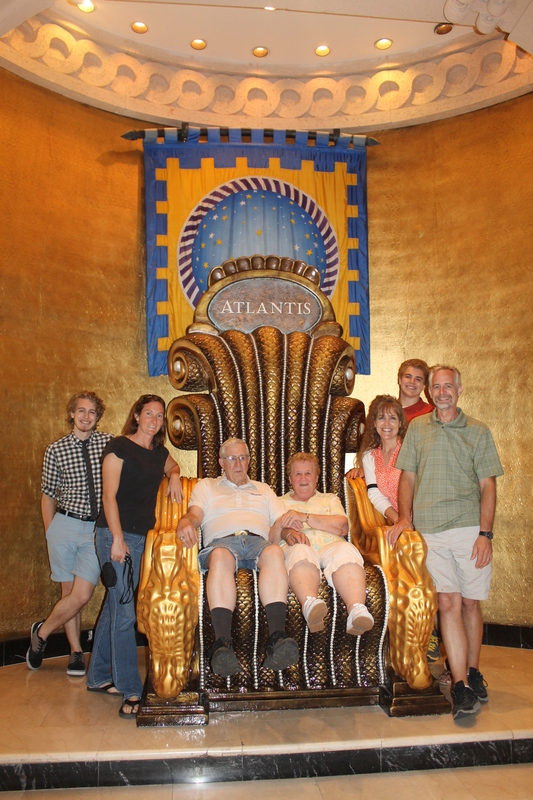 …and of course Atlantis and Marina Village on Paradise Island. Jen Rogers even joined us. One of the highlights of my (Mindy) day is the half hour coffee break every day at 4pm with Faye. 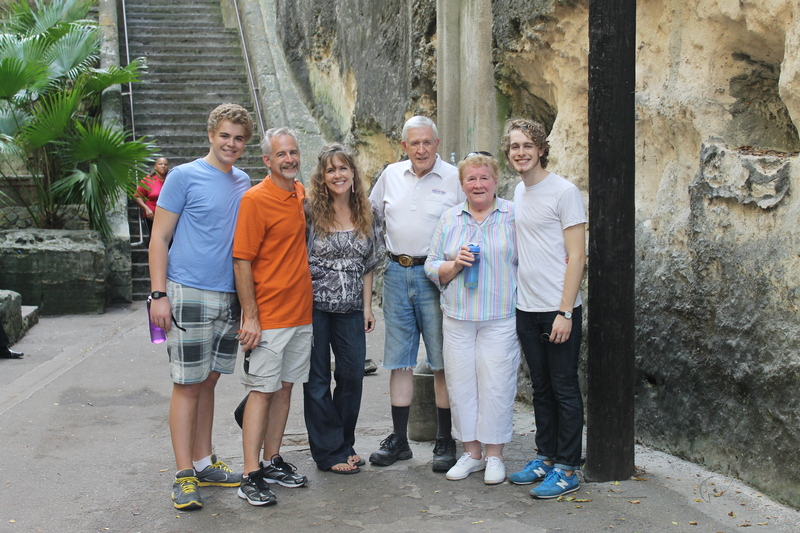 I really enjoyed it when Mom and Dad were able to join us when they were here. Mom and Dad were able to spend the Sunday they were here with a couple they knew from years ago. 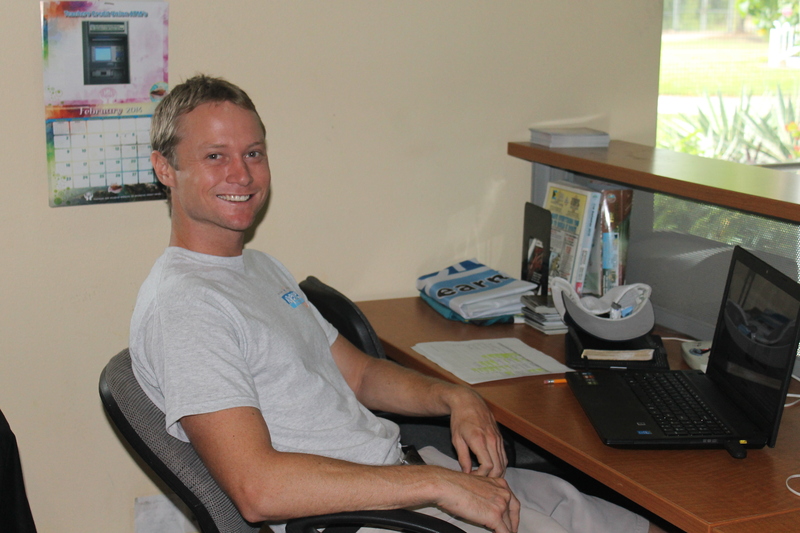 Colyn Roberts is Bahamian and he with his wife Jan own a Christian bookstore here on the island. 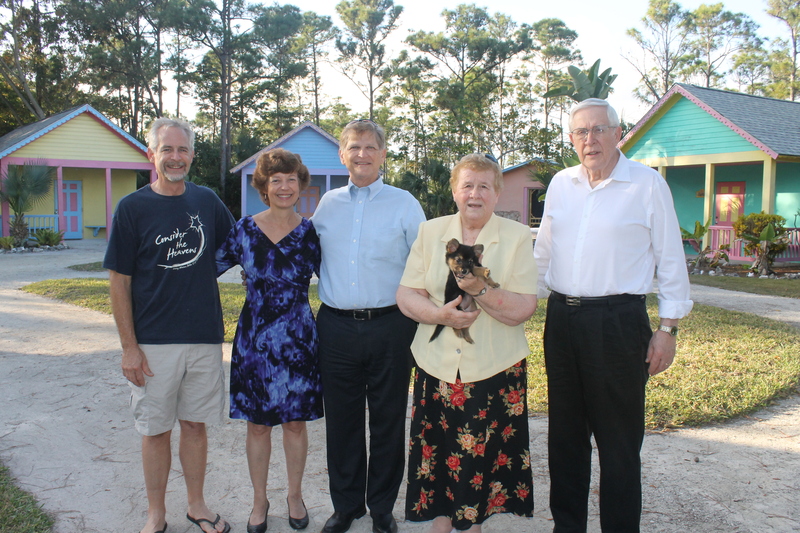 While they were here, we were able to show them around the Camp. 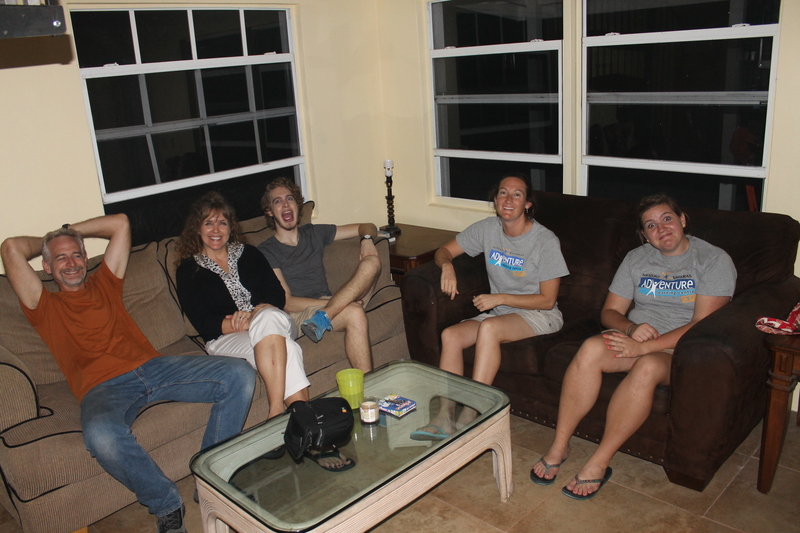 Billy and Leah Slater and family were over for a meal while Mom and Dad were here. 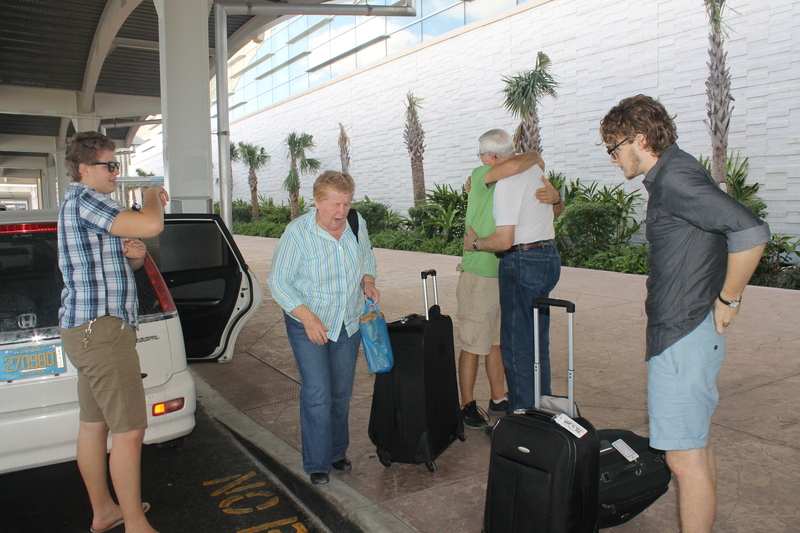 The shortened week (they got here a day late because of flight cancellations due to bad weather) went by so quickly, and before we knew it, it was time to say good-bye to Mom and Dad. We felt bad that they had to leave beautiful weather to go back to snow and bitter cold weather. A new outreach opportunity at the ALCentre that started the first part of February is the bimonthly showing of a Fulldome (Imax type) movie in the planetarium at the Centre. 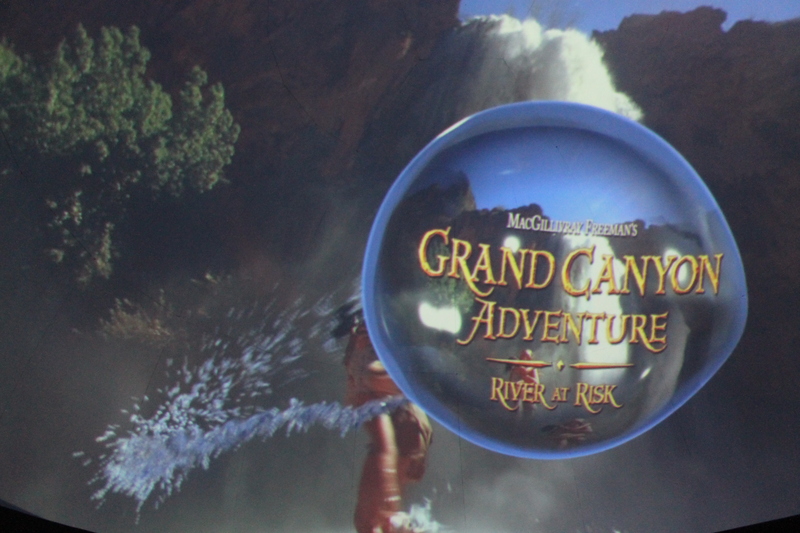 Now showing is the Grand Canyon Adventure). This is a picture of the dome during the showing. It is a way to bring in a little revenue to help with operation expenses and to give us an opportunity to share the gospel with the public. 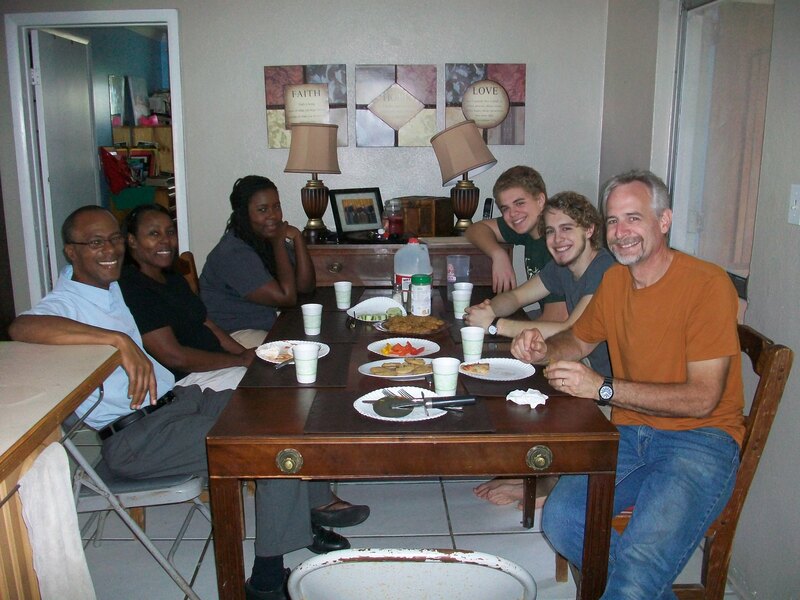 Another Sunday lunch with College of Bahamas students from our church. This time only Richard was able to join us. We have enjoyed getting to know this young man. Sean Wilson is the animal caretaker at the ALCentre. 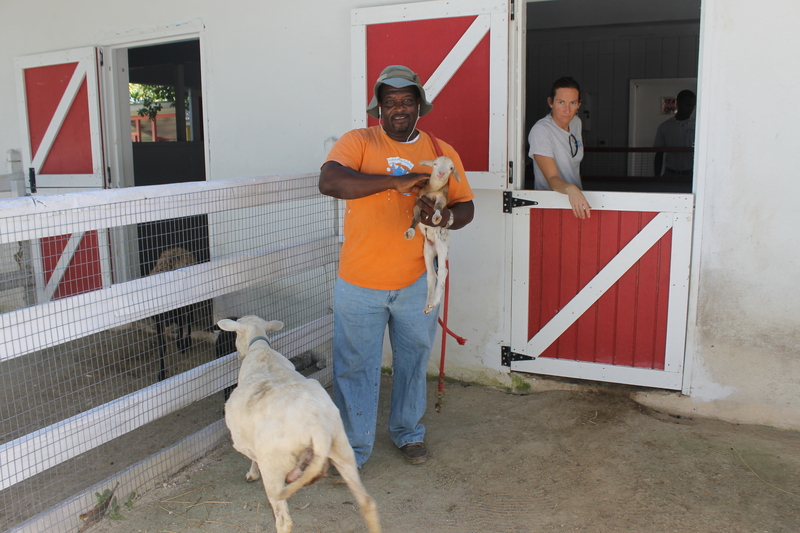 He has been busy this winter/spring taking care of the new herd of sheep and goats that are being born. This sheep was only hours old. The bath house laundry room now has a coin operated dryer. 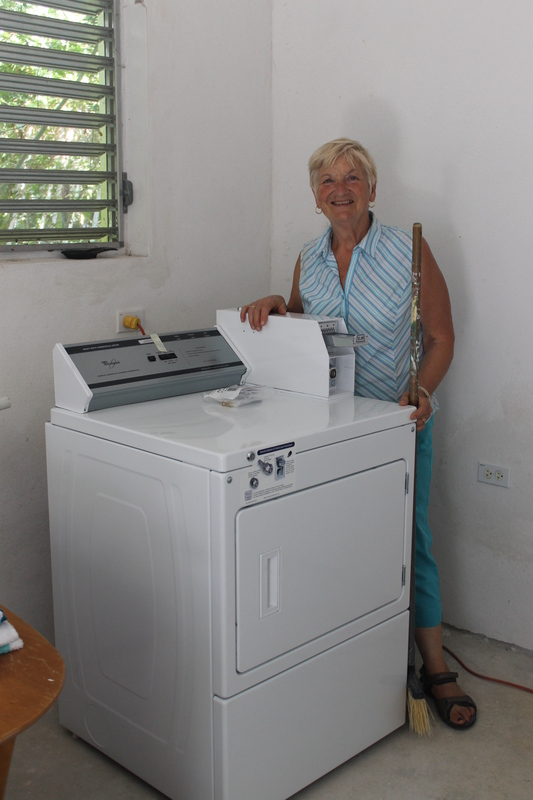 The dryer comes in handy when groups leave lots of bedding and donated clothing that need to be washed. We mostly use the clothes lines to dry clothes, but on rainy days, the dryer is nice. 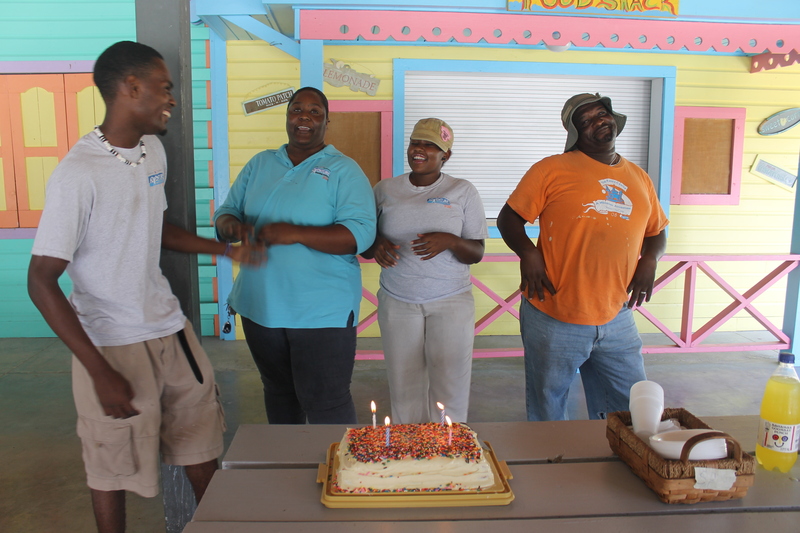 Birthday cake for 4 of the 7 ALC staff who had birthdays in January/February. 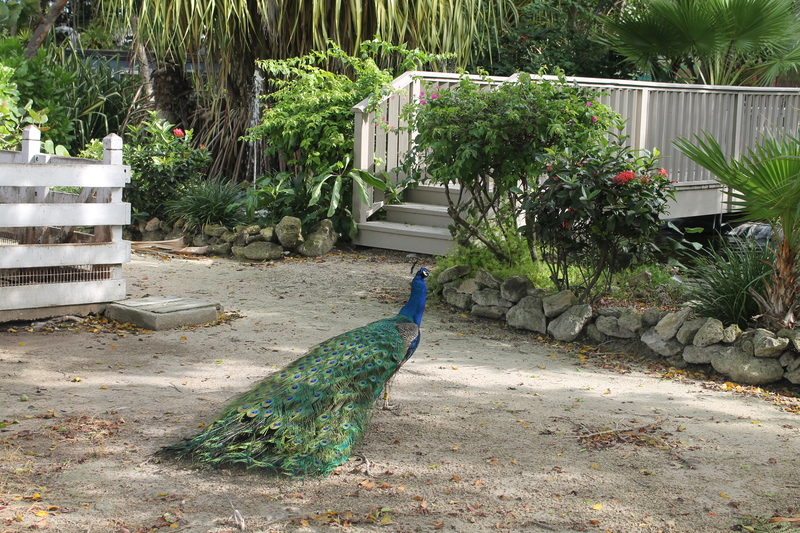 Ardasta Gardens donated 5 roaming peacocks and hens. They are beautiful creatures. 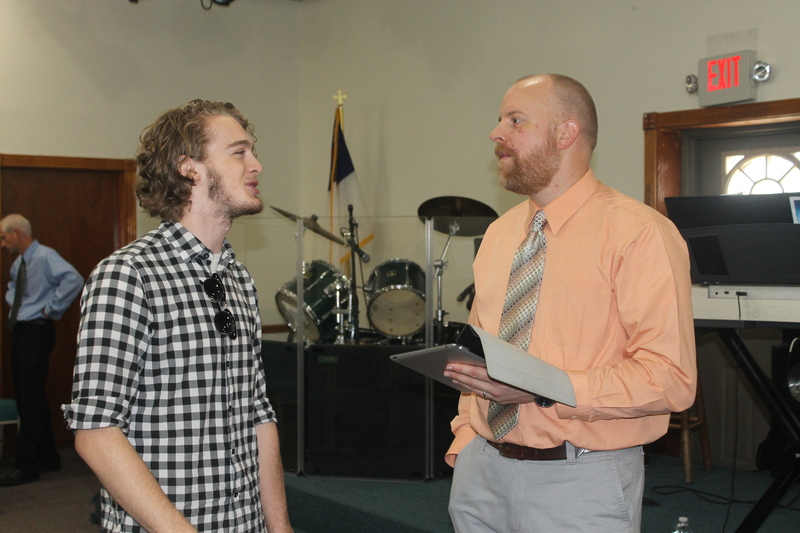 Zachary is working on voice lessons with our worship pastor, Keith Bunting. It is too bad the Buntings are leaving in June. Zachary could benefit from more instruction. 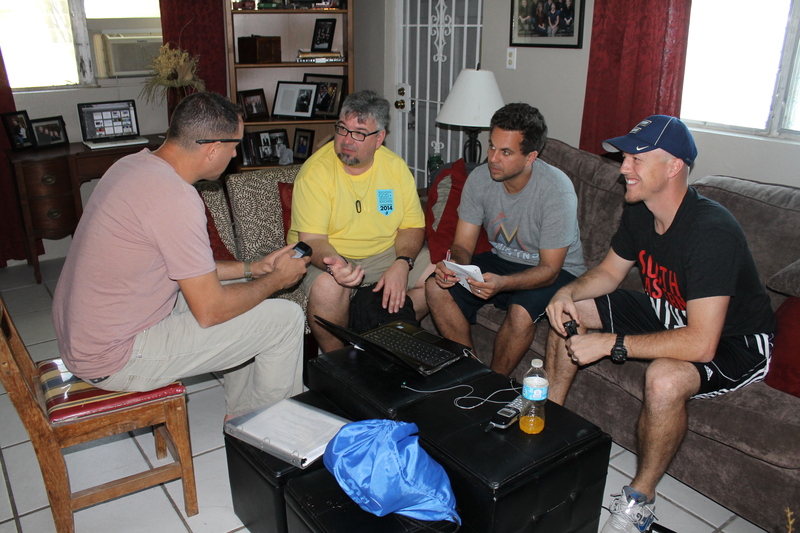 Tim meeting with Pastor Wilney Joseph from a local Haitian church. They were discussing ministry opportunities. 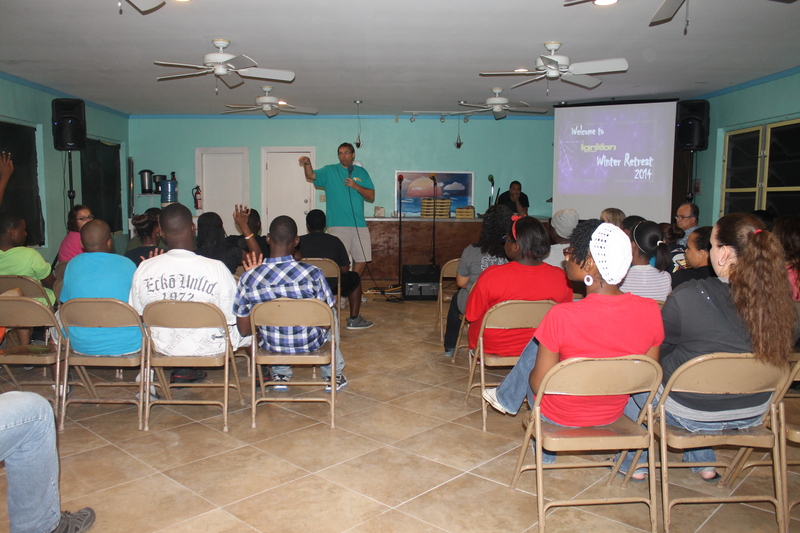 At the beginning of February, Calvary Bible Church of Nassau had their annual winter youth retreat. Their focus this year was purity. 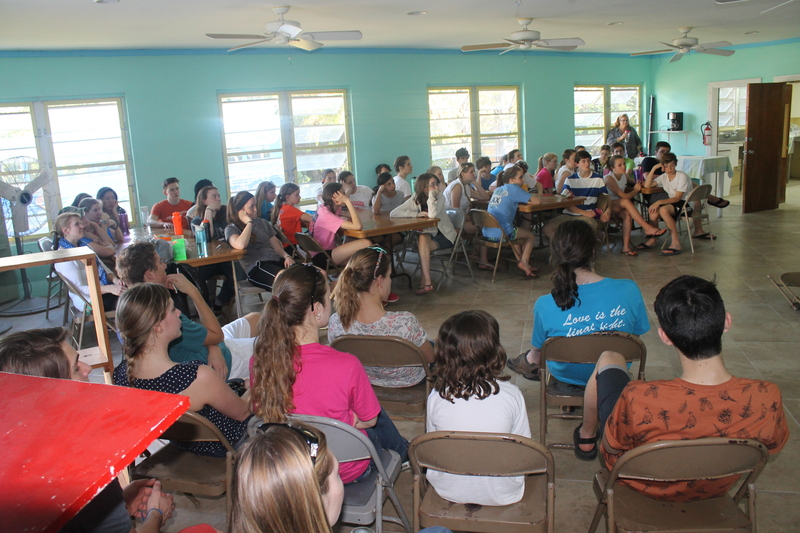 Calvary Chapel 8th Grade II mission team came mid February. Though equally as tiring and busy, it seemed a lot easier this time around. There were no flight cancellations this time. Lunch date at the British Colonial Hilton with Pastor Cranston. He visited us on our one year anniversary day but we were too busy to do anything that day. He told us to plan a day when we were not busy. This is a busy man, and we were honored to share part of one of his days with him. 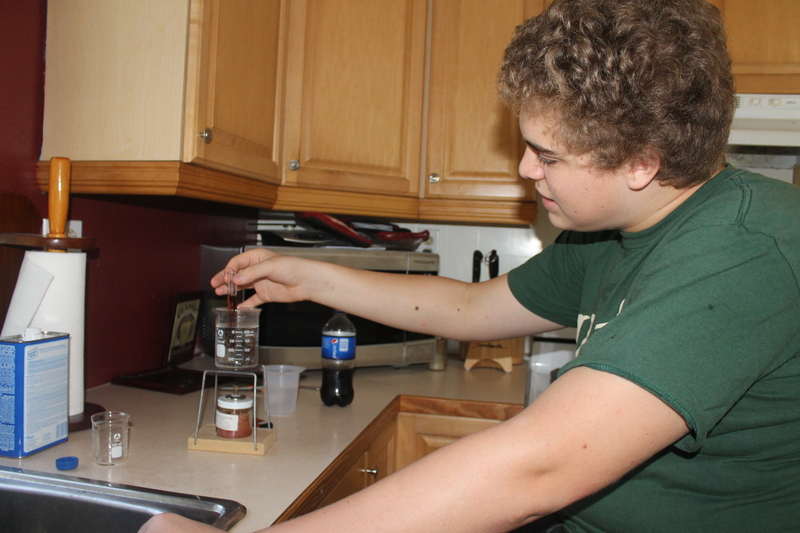 Logan working on a science experiment for his LUO biology class. Zachary’s chemistry class also requires lab work. Let Funday planning begin! Easter is still quite a ways away, but the Funday needs a lot of work to plan. 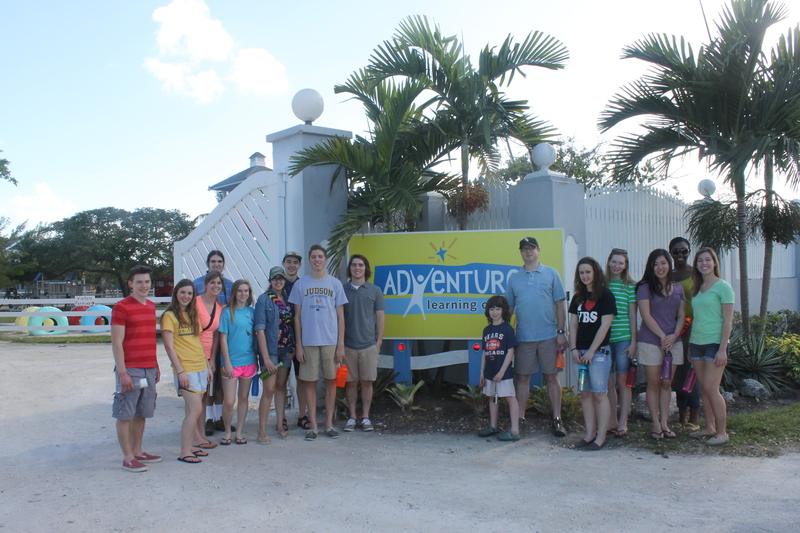 Eikon (young adult group from Calvary Chapel Ft. Lauderdale) was here for a long weekend in late February. This is always a fun group to serve. Jen Rogers, our ALC curriculum writer, spent one day teaching teachers. The science teachers/heads were at the Centre for a day to learn the new ALC science curriculum. Jen did a great job. 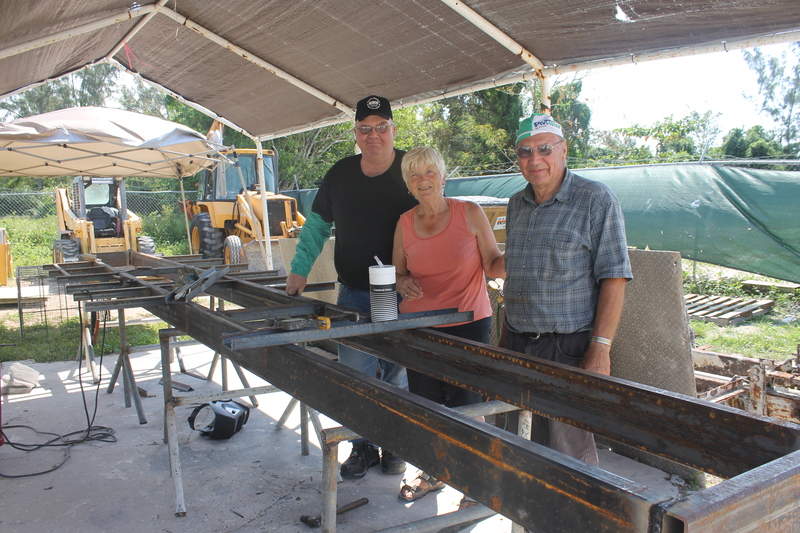 For a week, a friend of Bob and Faye’s came to help construct/weld a new frame for the train that was broken in September. 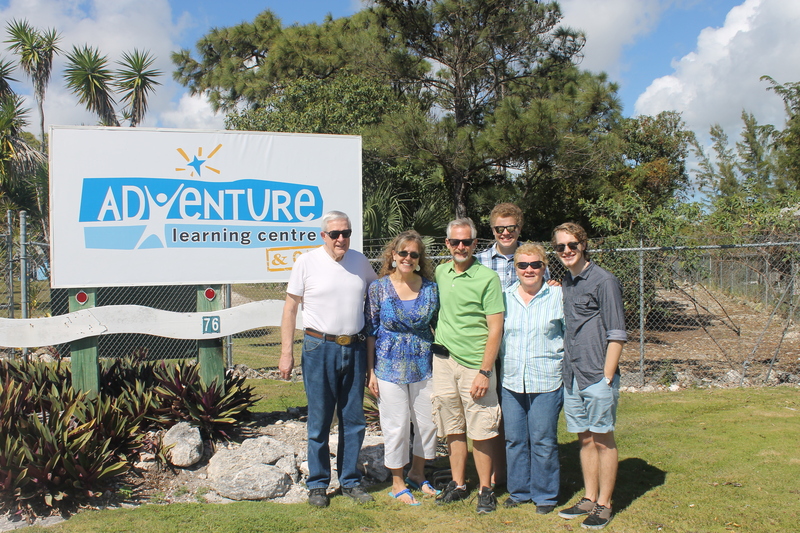 Andy was a huge blessing to the ministry and donated his time and talents to serve the Centre in this way. Thank you, Andy! Marion Brodeau was a facilitator in the fall. She left in November to work in Haiti for a couple of months. Her time in Haiti was cut short due to illness and some corruption issues in the ministry she was working with. She came back for a visit with us before she returns to her home in France. 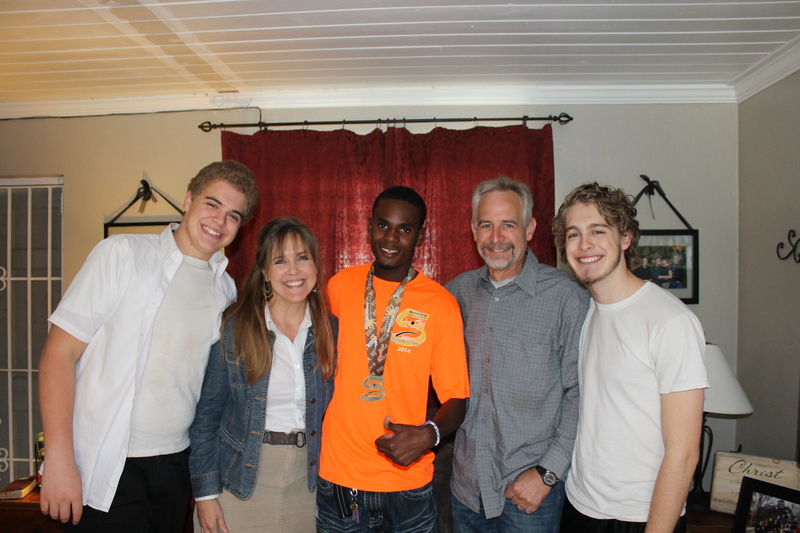 Tyler Payne has been with us for several weeks. He is helping with maintenance and the planetarium. 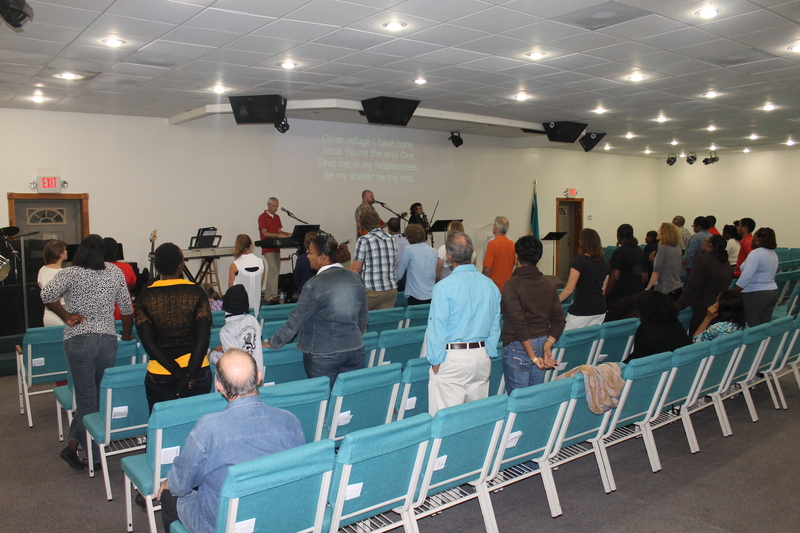 Friday evening, February 28, we had a prayer and praise time at church with pastor and song writer Doug Plank. 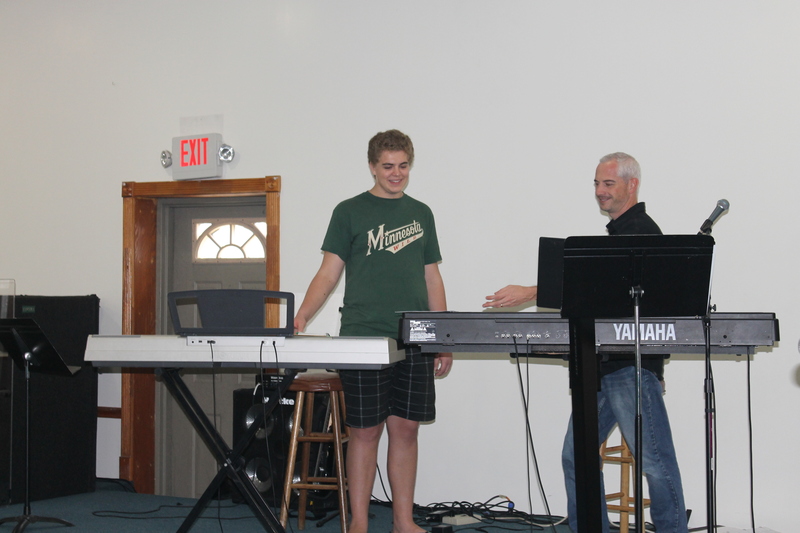 Doug Plank held a worship seminar at church, and Logan was involved. 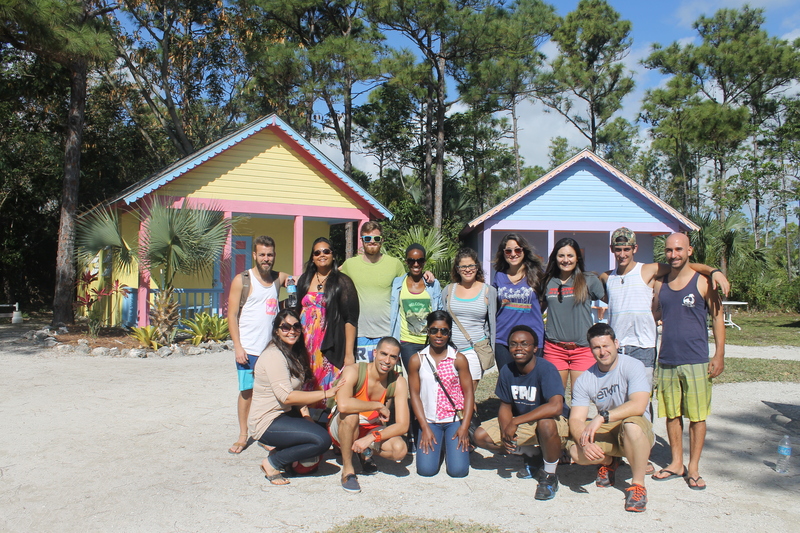 On Saturday, March 1, we welcomed 2 mission teams to Camp. It was a challenging week, but thanks to Bob and Judi being here, the week worked out well. 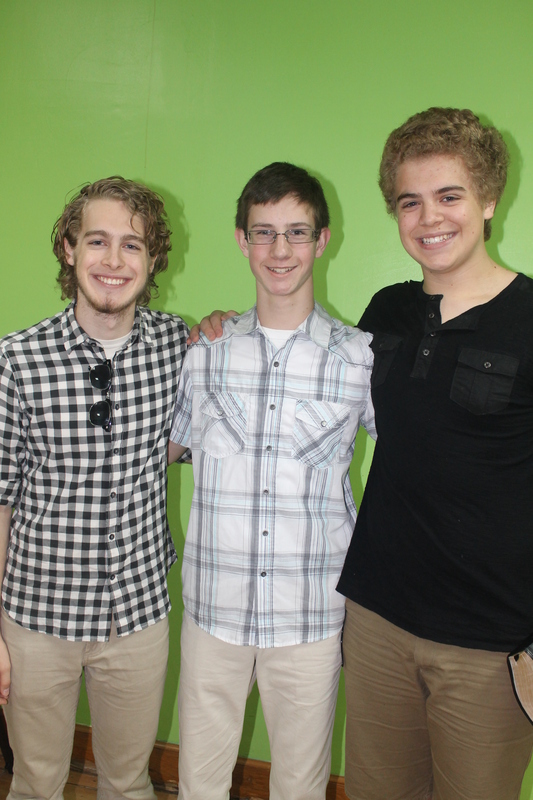 Parker Rau (in the middle) is Peter and Patti Rau’s son. Peter used to work with Tim at Living Waters Bible Camp in Wisconsin. Parker was with TKA. 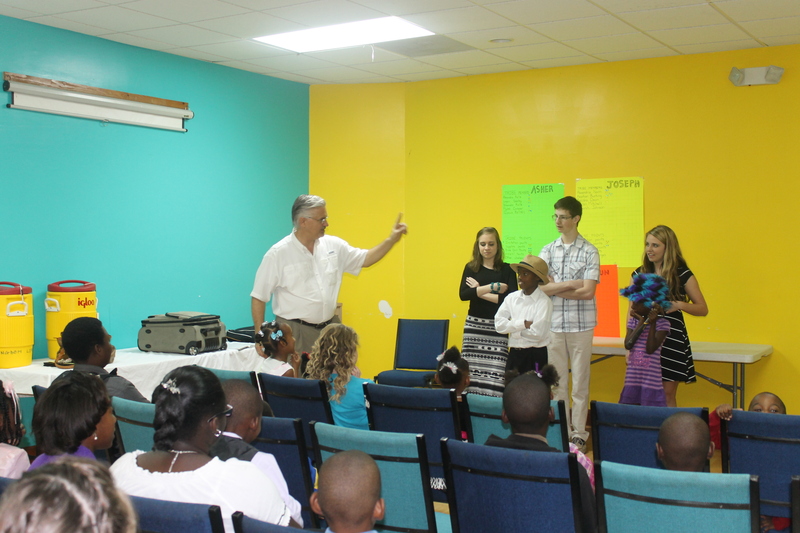 …on Sunday, TKA with Randy Grebe came to our church to work with the children’s program. 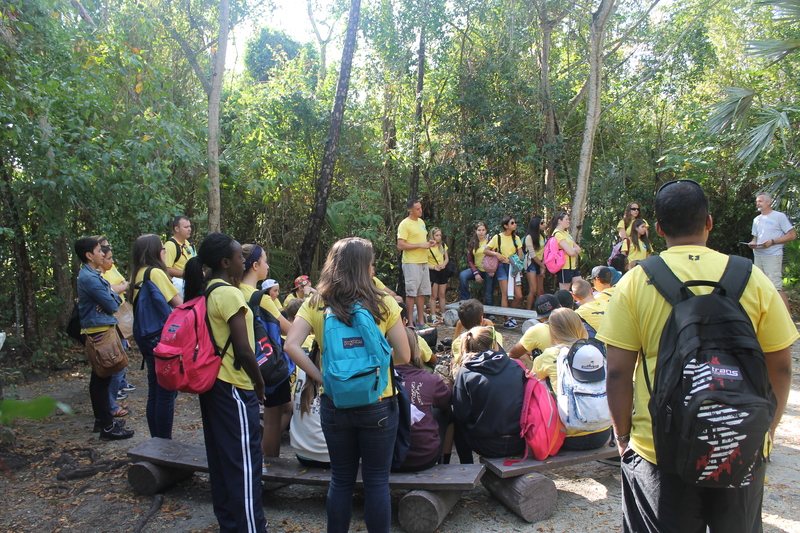 That week TKA ministered with the Children’s Emergency Hostel, various primary schools, All Saints Camp, and ALC. 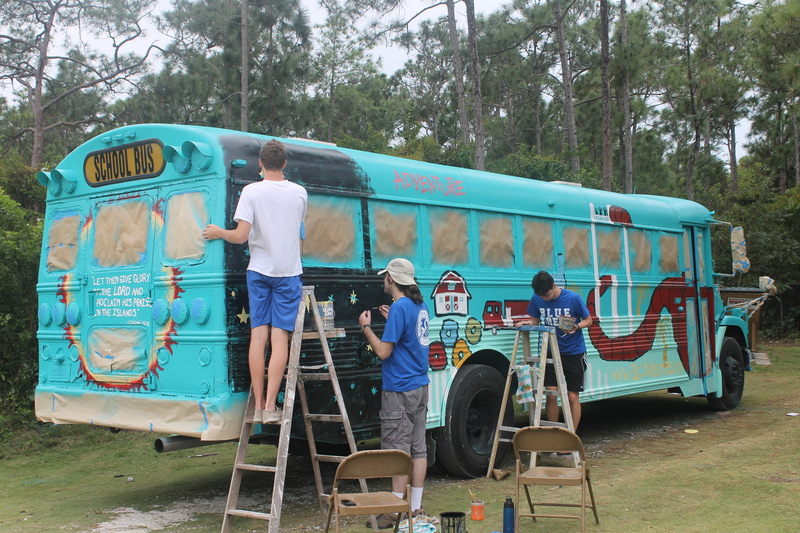 Judson served at the Centre and Camp, served at All Saints Camp, and designed and painted the art work on the new-to-us bus. 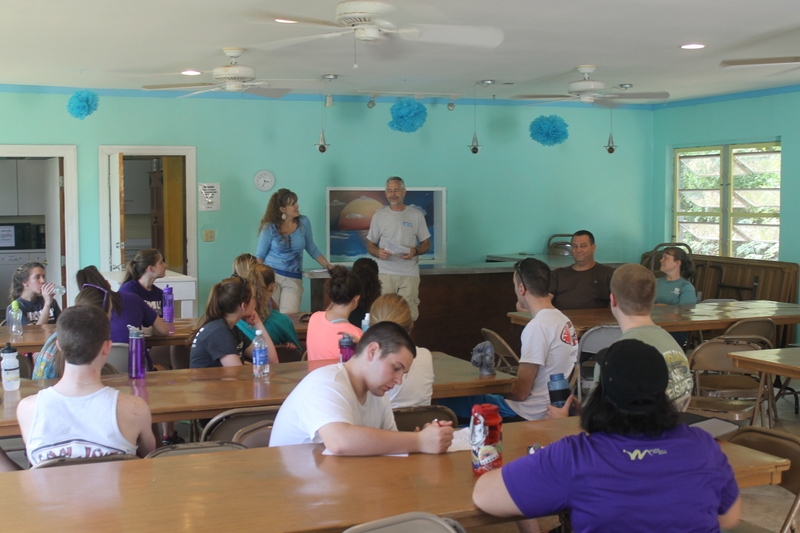 Friday we welcomed James Madison University to camp. We had 3 groups here for almost 24 hours. It was a challenge, but it worked out. 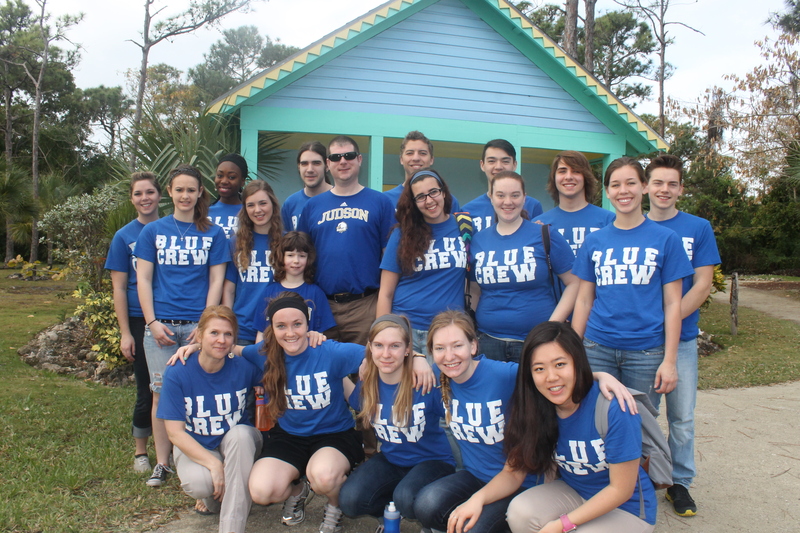 James Madison University was here for a week serving at Uriah McPhee Primary School. 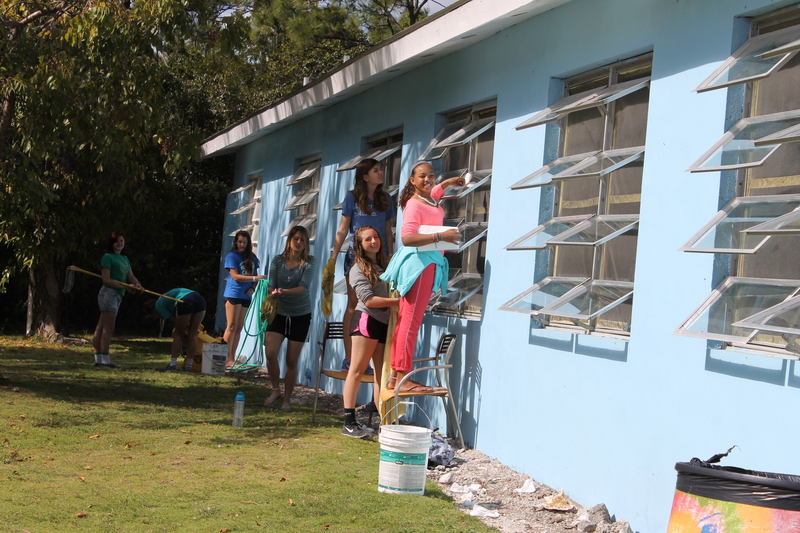 One of the projects that TKA, Judson and James Madison worked on was painting the exterior of the girl staff cottage. Yesterday we had a meeting with a young man who is desiring to minister to Bahamian children in the area of health and fitness. 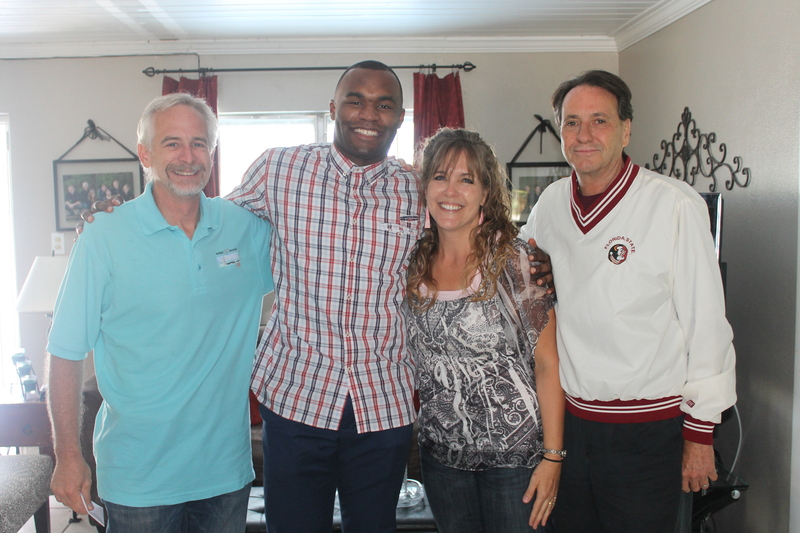 His name is Myron Rolle. He is currently in medical school at Florida State but used to play football for the Titans and Pittsburgh Steelers. 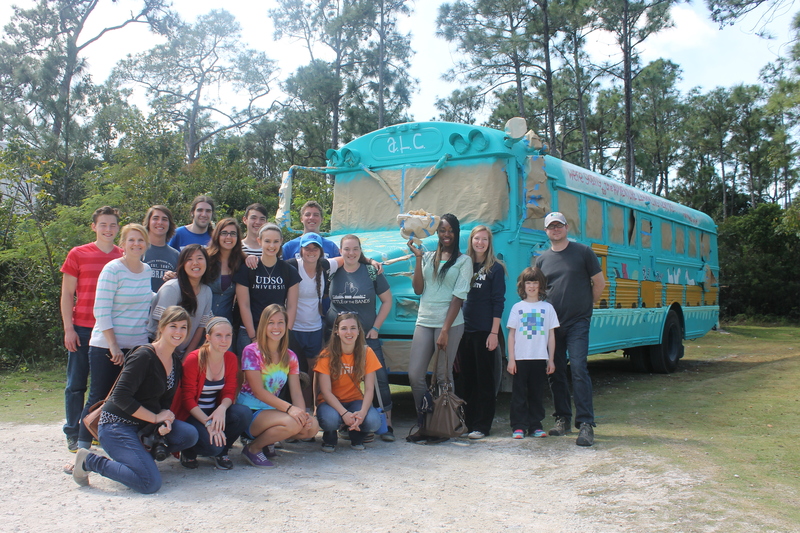 We hope we will be able to serve him and his group this summer as they come to work with Bahamian children. With Myron was his father’s friend Andy. Had lunch with these awesome people yesterday. 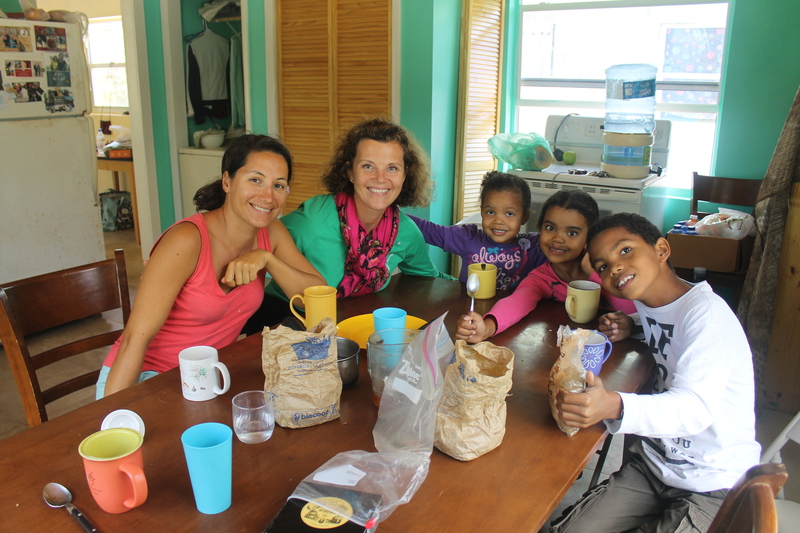 Marion Brodeau and Cathi Mott with her 3 darling children. Cathi used to be an ALC facilitator in the late 1990’s and married a Bahamian man 17 years ago. Whew! It takes a long time to get caught up on 2 months of happenings. Thanks for your patience and for taking the time to get caught up on what is happening. We will try not to let another 2 months go by without updating this blog. For this aging facility (the Camp and the Centre). Things naturally fall apart and quit working as they get older and are used . Tim, Tom Schafer our maintenance guy, Bob Browning (our Canadian friends here until the end of March), and now Bob Balson are busy all the time fixing and repairing things. Not only is it tiring work for these guys, but it can also get quite expensive.